This document describes how to use Mergeall to sync content on Android devices. It primarily focuses on running command lines in the Termux app, and more briefly explores a Mergeall GUI alternative on this platform. This coverage is provided freely, but with no warranties of any kind. Findings here reflect testing on Samsung Galaxy devices running Android 7, 8, and 9 (Nougat, Oreo, and Pie). Given the wide variety of products and rapid—really, supersonic—rate of change in the Android world, applicability to other devices and Androids cannot be guaranteed. Mergeall itself changes content by design: see its usage cautions before using the approaches outlined here. Appendix C: Android Q—the Future is Closed? If you're able to meet its requirements below, Mergeall on Android provides incremental backups and changes propagation for content stored on your smartphone. With a few simple commands (or a fledgling GUI), you can sync content on your phone's internal storage or removable SD card both to and from an attached USB drive, and can do so right on your phone itself. The net effect turns your phone into a portable storage device for arbitrarily large content collections, without requiring card removal or device rooting, and without the cost, speed, and privacy negatives of cloud storage. The package that hosts the guide you are reading is a supplement to the Mergeall system. It comes with precoded helper scripts that you can run directly on your phone from the Termux app's prompt. Though not required, these scripts are designed to simplify Mergeall's command-lines mode on Android, and minimize the risk of user errors. To make edits on smartphones easier, these scripts also use common settings in the included .bash_profile file, which you'll modify for your drives' IDs and folder names. Besides their role in scripts, these settings provide quick command-line access to your folders in general. For Mergeall users who break out in hives at the thought of using command lines, this guide's Appendix B also includes coverage of using Mergeall's GUI in the Pydroid 3 app, and this package includes patch files needed to make the GUI work. While this approach comes with code changes, operational issues, and pay-or-else advertising that make it a secondary choice here, some users may prefer a GUI even if it entails extra drama. If you wish to explore this option, be sure to read the Termux coverage in the main part of this guide first, as most of it applies to Pydroid 3 GUIs too. Terminology notes: Android's history and variability make documentation challenging. In this guide and its scripts, the terms "SD" and "USB" are used to mean a removable microSD card, and anything that works on the USB port, respectively, and the terms "external" and "removable" are used interchangeably for a drive that can be detached from your phone (i.e., SD or USB). Your device also has nonremovable storage called "internal" here, though Android often refers to this as "external" and makes it available in a folder named /sdcard. And if you don't have a removable card, your phone instead has a nonremovable "external" partition on your phone's internal drive set aside for storage—and confusion. In the name of generality (and sanity), this package's scripts use the more function-related "data" to mean the content copy kept on your phone (e.g., on internal storage or removable SD card), and "plug" to refer to the content copy on your attached USB drive (e.g., on flashdrive or portable SSD); extrapolate as needed for your use cases. The term "phone" crops up informally here too, but this guide applies to Android devices of all types. And to any grammarians in this document's audience: some of the closed compounds used here, including "logfile," "zipfile," and "fullscreen" may rankle a few purists, but they just make sense (the compounds, that is, not the purists). The sections that follow go into these requirements in more detail. Later sections cover setup for these requirements, and usage of this package's helper scripts. The positive take here is that Mergeall on Android may be constrained, but it does work. While some users may prefer pulling their SD card and syncing on a PC, this is delicate work in the extreme, and isn't possible on all devices. With a USB drive, a little up-front work, and either simple command lines or GUI, Mergeall brings a more PC-like experience to your on-phone content management. The first requirement is an absolute: Mergeall works on Android devices, but only if they are running 2017's Android 8 (a.k.a. Oreo, and sometimes just O) or later. Earlier Androids have a showstopper bug which renders content-sync tools like Mergeall unusable. You can still use Mergeall to manage your phone's content prior to Oreo, but not on Android itself: remove your card and sync it on your PC. The short story on the bug is that earlier Androids are unable to copy file modification times to either FAT32 and exFAT drives or internal storage on non-rooted phones: file content can be copied correctly, but copied files are always stamped with the time at which the copy was made, not that of the source. This is lethal to content-sync tools like Mergeall, which rely on file timestamps for comparison speed. Without timestamp copies, on-phone content copies cannot be compared to other copies accurately, and quick content syncs are impossible. This issue is well-known, long-lived, device-wide, and not specific to Mergeall, Python, or Termux. In fact, a shell cp -p copy command fails to copy times with an error before Oreo too—see the Nougat logfile. It stems from Android's former FUSE-based filesystem, which required root access to update file times but not content, and was eventually replaced with Samsung's SDCardFS. For more background, try the bug report here, the thread here, and searches like this and this. As an example of its wide swath, this bug also kills calendar-file backup copies in the Frigcal program, which makes a cameo appearance in Appendix B; prior to Oreo, many programs were impossible on smartphones. Though likely unintentional, it's unfortunate that the world's most-used mobile operating system didn't support non-cloud content syncing until 2017 (and still doesn't for many prior-version users). The good news is that this bug is now fixed, making cloud-free storage on Android finally practical for non-trivial content—and just in time for the larger-storage devices beginning to appear. This section was rewritten February 2019 for new findings, and updated April 2019 for Samsung's reply. Both skews were observed in and are relative to the US Pacific time zone, which is normally 8 hours behind the UTC base. These are likely symptoms of the same exFAT bug in Samsung Android, and may eventually be fixed in its future versions, but they can wreak havoc with Mergeall file comparisons today. It's important to note up front that, due to testing constraints, it's unknown whether this flaw lies only in Samsung software or is more widespread. exFAT is not part of Android's AOSP core-functionality stack (described here and here) which all phone makers augment with code from various sources (described here and here), and the issue is labeled "Android" in this document for brevity alone. Before making filesystem choices, you'll want to compare exFAT-drive file times on your own PC and Android devices to see if this defect impacts you. Even if limited to Samsung devices, though, this bug's scope is large. It's also worth noting that you may be able to use exFAT in some contexts anyhow. It's now supported on most Androids; the first bullet above applies only to content created on Mac OS; this may be a Samsung-only issue; and exFAT-drive files may in some use cases squeak by as incorrect-but-good-enough for Mergeall comparisons because their mistakes are consistent. Moreover, users who will only ever backup on-phone content to a USB drive are exempt from exFAT PC interoperability concerns. Until this bug is fixed, though, it's dire enough to recommend FAT32 as the more reliable choice for your Mergeall-on-Android drives. If you're willing to take that recommendation on faith, feel free to skip ahead to the next requirement now. For the curious and skeptical, though, the following traces the bug's forensics—beginning at the scene of the crime. The first symptom of this exFAT bug is easiest to diagnose: in testing on three recent Samsung devices (a J7, an S8+, and multiple Note9s), exFAT file timestamps created on some PC platforms are interpreted differently on Samsung Android than they are on any other platform tested. That is, the same file on the same exFAT drive reports a different modification time on Android alone. Files were created on the same exFAT-formatted USB flashdrive and microSD card on Mac OS El Capitan, Sierra, and High Sierra; Windows 7, 8, and 10; and Android Oreo and Nougat. Linux wasn't included, because its exFAT support is sketchy. All the created files reported modification times identically and correctly on all these platforms—except the two Androids. On the two Androids, only the files created on all three versions of Mac OS reported modification times incorrectly skewed 16 hours ahead of their correct values. Files created on Windows and Android reported times correctly (in this test, at least: stay tuned for more on Android times). In other words, this test's results make the flaw appear to be a double bug: the Mac OS PC platform records exFAT timestamps in such a way that triggers an incorrect interpretation on the Android mobile platform. Files created on exFAT drives by Mac OS (only) report incorrect times on Android (only). No, really. For a more graphic look at the problem, here is a folder of files created on Mac OS High Sierra, as it's seen on Mac OS El Capitan, Windows 10, and Android Oreo ("Today" on Mac OS means 1/15/2019, and 1/16 was still tomorrow when this test was run). As you can see, the file times are wrong by 16 hours on Android alone—files created around 8:20 AM report their times near 12:20 AM the next day. Conversely, files created by this test on Android report the same and correct times on Mac OS, Windows, and Android. That makes this seem a one-way bug: it impacts just exFAT files created on Mac OS and viewed on Android, and not vice versa. You'd also never notice it if you stick to PCs (Windows times are correct on Mac OS and vice-versa), or limit your scope to just Windows and Android (Windows times are correct on Android and vice-versa). As the next section will explain, though, the latter deduction falls apart in the face of fresh evidence. But wait, it gets worse. The second symptom of Android exFAT anomaly is subtler and took more digging to unearth: in addition to the prior section's +16-hour Mac OS content skew, Samsung Android devices may also write file modification times incorrectly on exFAT drives. In later tests run on the same Samsung Android devices, files saved to internal storage and FAT32 drives recorded modification times correctly, but some saves to an exFAT USB drive erroneously recorded times that are interpreted as 16 hours behind the actual save times on every platform except Samsung Android itself. No, really. The facts in this category are bizarre and even appear to be random. The incorrect times saved by Android are always incorrect on both Mac OS and Windows, but not all times saved by Android are incorrect (which is why this effect was uncovered later), and those that are wrong seem to depend on program and/or context (e.g., one program wrote new files' times correctly but existing files' times skewed—sometimes). This makes this skew difficult to trigger, but easy to spot when it appears. 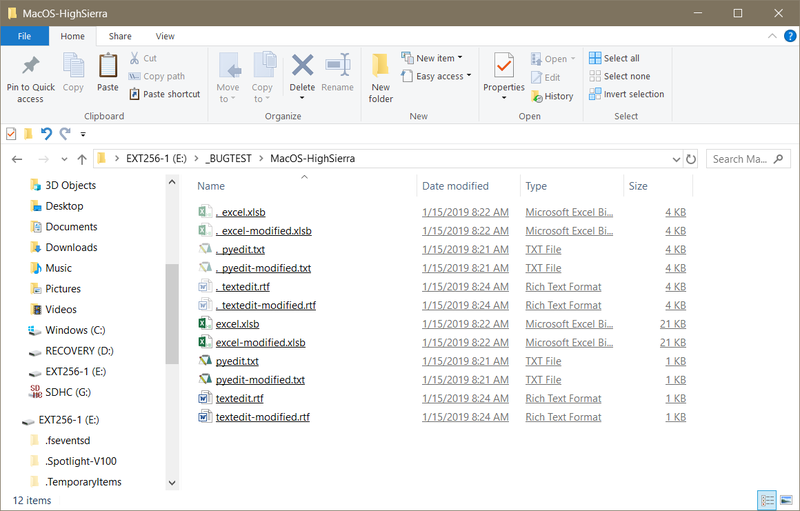 As a brief example, a folder of files on an exFAT USB drive which began like this was updated and extended by assorted programs on Android around 11:30 AM on 2/27/2019 (again, in the Pacific time zone), yielding the following scenes on Android, Windows, and Mac OS; as you'll notice, some of the Android-written timestamps are wrong by -16 hours on the latter two. That is, it's not just reads, and it's not just Mac OS: the whole conception of time in whatever software does exFAT on Samsung Android disagrees badly with others. This is really just the other side of a single bug's coin, and this guide doesn't have time or space to document it in more detail (and it's really not this document's job to do so in any event). But there's clearly something quite wrong with exFAT on Samsung Android today. When Android copies files from an exFAT drive, it copies their incorrectly skewed times too. This suffices for later change detection: skewed times copied will compare correctly to skewed times on exFAT-drives. Unfortunately, this also makes the mistake permanent: if the copied files are ever copied unchanged from Android to PC—or the drive hosting such files on Android is ever used on a PC—the copied files will all be off by +16 hours, register as spurious differences, and be recopied unnecessarily. Though less tangible, the skewed times copied from exFAT may also pose other challenges if you ever need to manually reconcile copies in the future. When Android saves files, it records times correctly on both internal storage and FAT32 drives. Paradoxically, this can make the exFAT skew more error prone: if you ever save a file on your phone exactly 16 hours after its latest save recorded on an exFAT drive, the updated file will not register as a difference from the exFAT drive, and will not be propagated to your other devices. This seems unlikely to occur; the file would have to be saved on your phone only 16 hours (plus or minus 2 seconds) after the save recorded on exFAT, and this matters only if you will sync changes from your phone. Despite their rarity, though, lightning strikes do happen, and "unlikely" shouldn't be an acceptable term when it comes to your content. When Android saves files, it may record times incorrectly on exFAT drives. Such files may suffice for Mergeall comparisons on your phone itself: their incorrect -16-hour skew written to the drive will be offset by an incorrect +16-hour skew when read from the drive (or, equivalently, on-phone usage will ignore the flaws that skew file times on PCs), and consistently incorrect is again good enough. Still, "good enough" is also a term best avoided when your content is on the line; in this case, the incorrect times recorded by Android on such exFAT files will forever disagree with both your PC and off-phone reality in general, and again may hamper future reconciliations. Just as insidious, there seems no way to compensate for the Android time skews automatically. For example, because exFAT drives may contain content created on multiple platforms, just some of your files, those saved on Mac OS, will report incorrect times on Android, and programs like Mergeall cannot tell which differences are valid and which reflect +16-hour Mac OS skew. The -16-hour write skew will be present on all PC platforms, and its nearly random nature seems even more impossible to work around. Happily, FAT32 drives both interpret and record times correctly, and are thus immune to this bug. 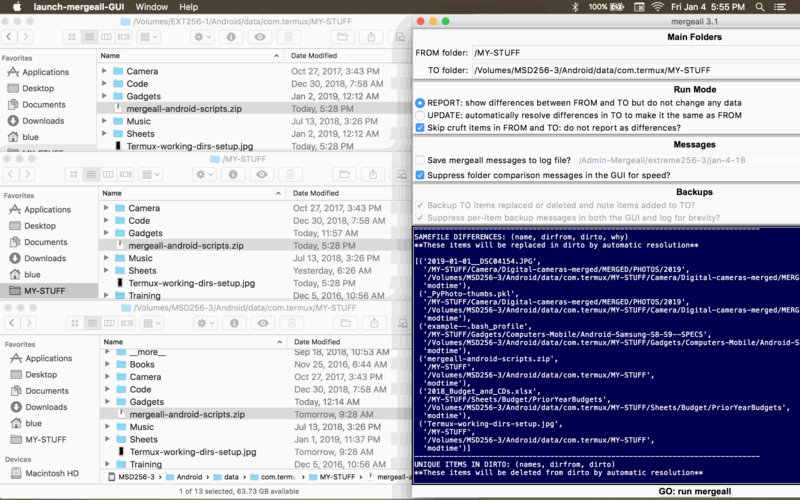 For instance, here's what the same file saved on Mac OS looks like on Mac OS and Windows; on Android, this same file's time is skewed on an exFAT drive, but correct on a FAT32 drive. This means FAT32 provides a path for using Mergeall on Android. Less happily, this precludes mixed FAT32/exFAT usage: because only exFAT drives skew times, their files won't compare correctly with the same files on FAT32 drives (as for others) and spurious differences and recopies will ensue. In sum, this defect renders exFAT generally unusable on Samsung (and perhaps other) Android devices, and makes it impossible to recommend exFAT for Mergeall on this platform today. Ultimately, this is a bug in Samsung or Android code that should be fixed. Although file times may have been broken on Android in the past, exFAT files today still report and record incorrect modification times on the Samsung Android platform alone, and neither file sources nor program contexts justify further deferring a repair. Barring a future Samsung or Android fix, though, your safest bet is to use FAT32 for all the removable drives you will sync with Mergeall on Android for both accuracy and interoperability. This is regrettable, given exFAT's support for larger files and compatibility with other filesystems' times. Per its well-known limitations, FAT32 doesn't support files larger than 4G, and you may need to manually adjust your FAT32 drives' modification times twice a year to keep them in sync with non-FAT drives after daylight-savings-time (DST) rollovers. The internal storage in both your PC and phone, for example, is usually a non-FAT drive whose UTC times clash with FAT's local times. See the FAT times fixer tool covered ahead for a simple way to make the adjustment; if you use FAT32, you'll run this tool on your intermediate USB drive (to match your PC and phone), and possibly on a removable SD card (to match your intermediate drive). The upside is that, thanks to Microsoft patent constraints, FAT32 is still much more widely usable today than exFAT. More importantly, its timestamps are implemented more consistently and interoperably; for Mergeall on Android, this is a killer asset. The exFAT epilog: After this section was written, the exFAT bug it describes was verified to still exist on Samsung devices running Android Pie (9), in addition to Nougat and Oreo. Despite this longevity, the web is woefully silent about this bug—which is hardly surprising, given that timestamps couldn't be copied on Android at all until 2017's Oreo, which made the platform unusable for an entire class of software. It's not impossible that Linux mount options may be involved (see this thread for leads), but it is impossible to use—or even explore—them on non-rooted phones. 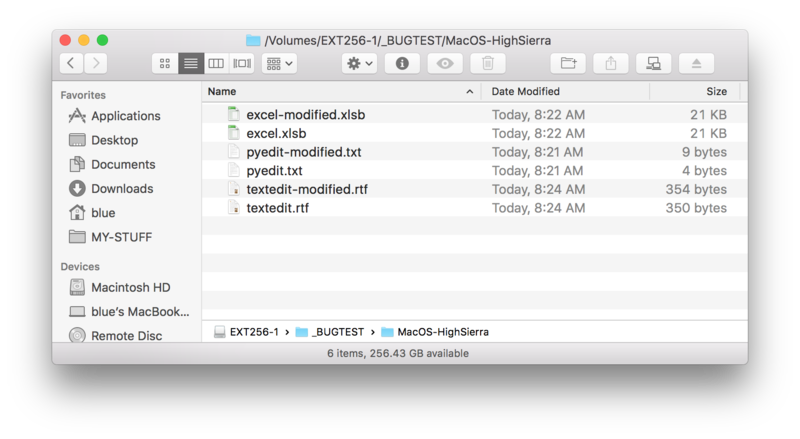 Another thread looks at a seemingly unrelated issue, but hints at pathology in Mac OS's exFAT implementation in general. For its part, the Mergeall development team has dutifully posted this bug on both Samsung and Android websites, as well as in the Samsung+ app (the US equivalent of Samsung Members at the time), but doesn't presently hold much hope for a fix. The Android website has already dismissed the bug as an OEM-specific "won't fix" (with no apparent interest in forwarding it to the market-leading OEM); there's been no substantive reply from Samsung on either its website or its app in a month and a half; and most support forums in the smartphone domain seem more likely to suggest restarting your phone and counting to 10. Update: shortly after the preceding paragraph was written, Samsung replied on the Samsung Members app to acknowledge an issue regarding the valid bit for time-zone offset not being set in their exFAT implementation (background details here and here). This makes exFAT files' times correct when created and used only on a phone, but fails to accommodate creation and usage on other platforms, and explains this section's peculiar empirical findings. The reply also promised to try to improve the implementation, but cautioned that a fix may take some time due to dependencies on the current policy. While it's too early to file this under "happy ending," it now seems reasonable to look forward to a future repair; exFAT drives will be much more useful on Samsung devices when those drives are interoperable with PCs. 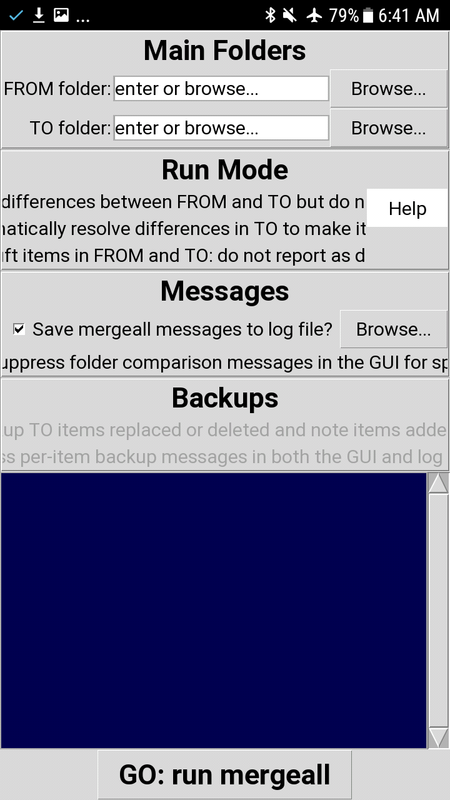 On Android, Mergeall's Tk-based GUI works marginally with caveats, but its command-line mode works fully and qualifier free. To use this mode, you simply need to use Mergeall's source code, and type command lines to launch it. 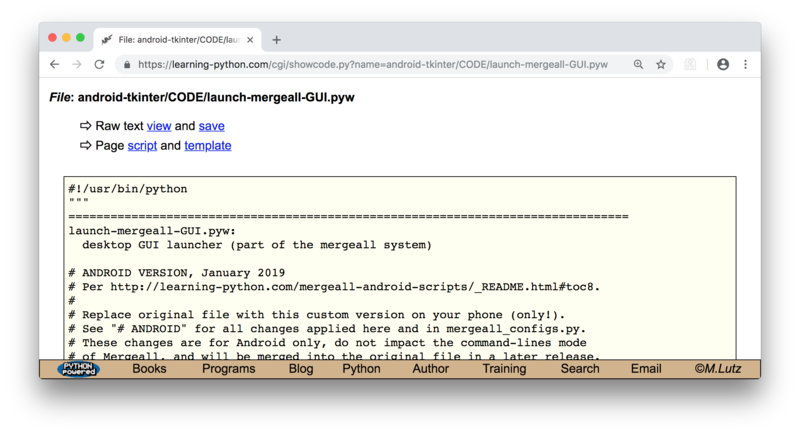 Although there are multiple ways to run Mergeall's Python source code on Android, the Termux app provides a full-featured Linux experience that seems best suited to the Mergeall task. Neither Termux nor command lines are required for Mergeall on Android, but they're suggested for most users. In more detail, Mergeall's apps and executables for PCs (Mac OS, Windows, and Linux) do not apply to Android, and its reliance on the Tk library (and Python 3.X's tkinter interface to it) means that using its GUI's source code on this platform entails major tradeoffs. Although there is some new support for using Tk in Python programs run on Android today, it comes with rude advertising, substantial glitches, and extra steps that make it difficult to recommend for Mergeall syncs. See the notebox ahead for more on this story; it's evolving, but at this writing Tk may still be a nonstarter for many Mergeall users on Android. This is roughly just a dozen taps, with the tab completion stressed repeatedly in this guide (and can be even faster if saved to a file). Although Mergeall's GUI comes with major downsides on Android today, its helper-script commands should still be easy enough to appease even the most chronically command-line phobic. But if you really hate command lines: For an alternative approach, check out Appendix B's coverage of running Mergeall's GUI with the new tkinter support in the Pydroid 3 app's IDE. There, you'll learn more about using Python tkinter GUIs on Android, and sample a leading alternative to Termux for running Python code on this platform. Because this alternative comes with significant tradeoffs—and shares most of the requirements and setup tasks covered here for Termux—it's been relegated to the supplemental-reading section of this guide. Despite its rough edges, the GUI does work in Pydroid 3, and you may wind up preferring it (and this author may too); but this guide's Android topics still apply, and its suggestions are for a user base at large. In addition to installing Termux, you must run its utility script termux-setup-storage to create Termux's writeable app-specific folders, and allow it to update files in internal storage and access removable drives more broadly. See this page for more on the Termux setup command. Without it, Termux—and the Python scripts like Mergeall that it runs—cannot read or update most of the folders on your phone's internal storage or removable drives. This makes content-processing programs like Mergeall unusable in Termux until you run this command. To illustrate the Termux permissions story, let's run some Python code within the Termux app. To do this yourself you'd need to install Termux and Python per ahead, but there's no reason to do so yet; this is just a demo. This also assumes some familiarity with pathnames (jump ahead to this section's notebox if you need more background); assumes basic Python knowledge (but you'll probably get the gist of this simple code either way); and uses Termux 0.65 (if your mileage varies in the future, it's probably due to a new Termux, a new Android, or both). This code shows most writes (i.e., updates) failing, but read accesses at all these locations work the same way at this point. As you can see, there's not much accessible before the Termux setup command is run. The Termux app-private folder at /data is the standout exception. It supports changes out of the box, but is largely useless for Mergeall, because this folder cannot be accessed outside the Termux app on non-rooted devices. This includes file explorers, photo viewers, and text editor apps, and disqualifies this folder for most Mergeall roles. Because you really don't want to store your content in a location that can be accessed by just one app (and a command-line-only one at that), Termux's scope is very narrow when first installed. 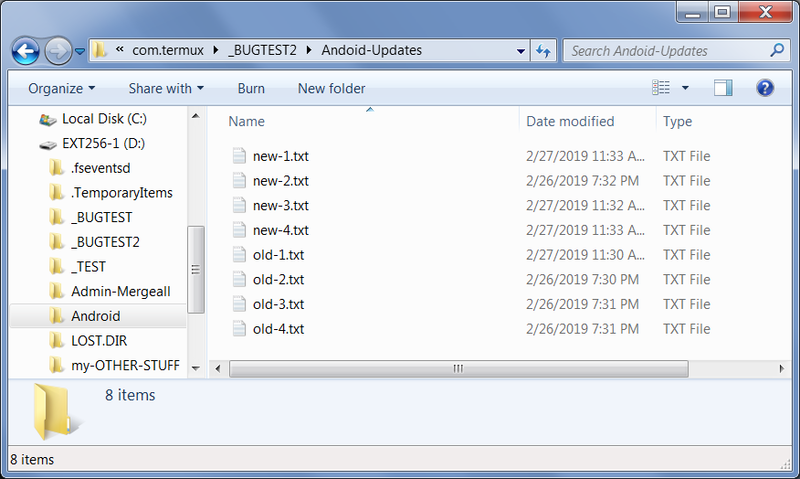 Technically, at this point Termux can also read and update its nested Android/data/com.termux app-specific folders like the one in the last command above, provided you make them manually on either removable drives or internal storage first. But you would have to do so in another app or on a PC: because Termux cannot access the containing folders yet, it cannot build the required folder paths under them. To do more, we have to move on. In more-practical terms, this means that Mergeall can compare content in any readable folder listed above, but can update content only in the writeable folders. This has major consequences we'll see in the next section. It's also narrower than the access available in some apps like text editors and file explorers, but Termux (and, we'll see later, Python-specific alternatives) impose some access limits today. As noted, Termux's setup command creates its app-specific folders, like the one used in the last command run above, but you can create these folders manually too (and we will in the setup part of this guide). Running the setup command creates these nested app folders if they don't already exist; this ensures that Termux, and the scripts it runs, have a place to make changes on removable drives. More important here is the third and failing command run in the last code listing above: even with enhanced permissions, Termux still cannot access all the folders on your removable drives—which leads to the next and perhaps strangest requirement. For more on Android pathnames: By now, you may be feeling a bit confused by folder pathnames if you haven't done much with command lines in the past. For a gentler introduction to the subject, see this guide's Appendix A for extra background that we'll omit here. Like much technical documentation, this guide has to walk a thin line between alienating newcomers, and boring experts. Update: though uncertain at this writing, Android Q may impose the same constraints on internal storage that KitKat imposed on removable media, and invalidate some of this section's coverage in the process. See Appendix C for more on the possible consequences for Mergeall—and every other program that saves shared data on the Android platform. After you run the Termux permissions command of the prior section, Mergeall is able to both read and change content anywhere in internal storage, and can read content anywhere on an external (i.e., removable) drive. To allow Mergeall to make changes on external drives, though, your content must be nested in the drives' Termux app-specific folders. In Mergeall-speak, this nesting is not necessary if an external drive will only ever be the from copy in synchronizations, but it is required if the drive will ever play the role of to. You can use the first of these for on-phone content copies if you have enough space, but must use the second for content on SD cards and USB drives that you wish to update. Since this is an arguably bizarre constraint, let's take a closer look at its rules. This seems simple—and even PC-like—but internal storage isn't enough by itself. For one thing, even if your on-phone content is in internal storage, you'll still need to sync to and/or from an external USB drive in most use cases. For another, if your phone's available internal storage space isn't large enough for your content (and many today are not), you'll need to store your on-phone content on your device's SD card instead. Since both USB drives and SD cards require nested storage to support updates, let's turn to this model next. Android uses IDs like this path's 25C9-1405 to uniquely identify external drives. Your drives' IDs will naturally vary too, and are displayed in popular Android file explorers (including this and this). More unusual here: on both SD cards and USB drives, content folders like this path's MY-STUFF must be nested six-levels deep in the drives' Termux app-specific folder as shown, if you wish to update them with Mergeall on your phone. This differs from internal storage, where anything under the /sdcard root works. Termux's explanation for why this is so is told on pages here and here. This restriction on updating removable drives came online in Android KitKat—to the dismay of both users and developers—and has seen multiple later mutations, including app-initiated run-time requests for storage permissions. Termux, and all other Python apps tested, however, remain limited to their own app-specific folders for updates to SD cards and USB drives. This may seem an odd requirement given that internal storage is wide open to changes, but it cannot be lifted in the context of Termux command lines today, and isn't as grievous in practice as it may sound. For instance, you can still access your content normally in a file explorer (as captured in this SD-card screen shot), and a home-screen shortcut (like this one) provides quick access to your nested content folder; see your file explorer to set one up. Keep in mind that no nesting is required for content stored in your phone's internal storage (i.e., in /sdcard), because it's freely writeable. 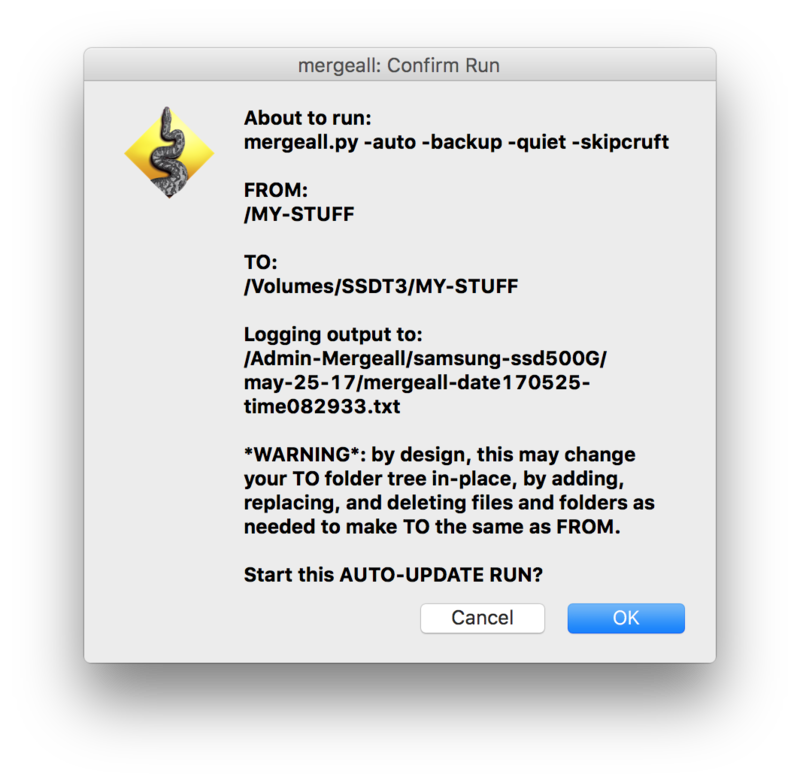 Moreover, you can store content at the root of USB drives and SD cards too, but only if you'll only ever read—and never change—it with Mergeall. Unless you're sure that a removable drive's copy won't be the subject of a future Mergeall update, it should be nested in the drive's Termux folder. Also keep in mind that Android's permission rules have varied much and often in the past, and seem likely to do so again in the future. While some media may grow more accessible and some less, it's impossible to foresee tradeoffs in a platform that seems to change the rules every other Tuesday (more on this in the following notebox). More on the (in)accessibility of removable-drive content: This section noted that internal storage is recommended for storing content on your phone because it is more accessible to other apps, but this merits a callout here. Due to the permission rules we met earlier, some apps that do not request broader access, including Termux, are unable to update content on removable media except in their own app-specific folders. This is why you must oddly nest your updateable content on removable media, including SD cards and USB drives, to manage it with Mergeall in this app. Unfortunately, this can also make it impossible to update such content in some other apps. As we'll see in Appendix B, the alternative Pydroid 3 GUI app has the same access limits—on removable media, it can update only in its own app-specific folder. For such apps, this is a bit of a catch-22: you must nest content on removable media to update it, but this cuts it off from other apps' updates. 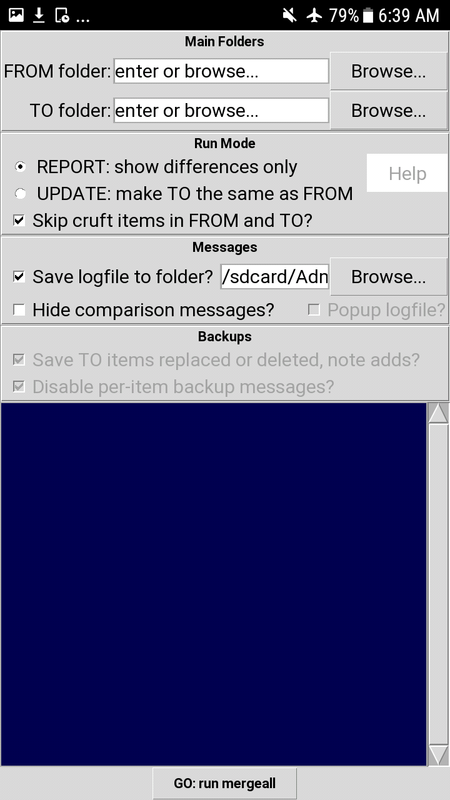 More tangibly, Pydroid 3 cannot update any content nested in Termux's app-specific folder on removable media—and vice versa. The net effect is that your choice of updating app is binding, unless you move your content. Luckily, this caveat's scope is limited: it impacts only updates on removable drives, and does not apply to all apps. 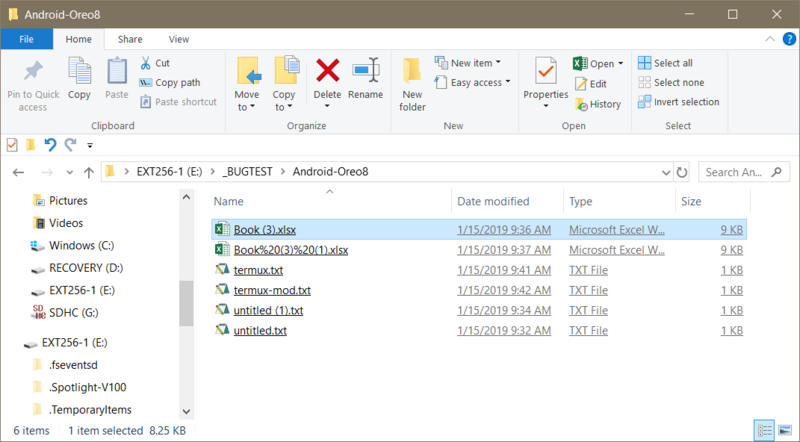 You can still freely view nested content on these drives, and modify it in general-purpose apps like file explorers and text editors that request broader permissions than Termux and Pydroid 3. If it's important to also update content in apps with narrower permissions, though, internal storage is your best option. Especially with the next section's peril factored in, the strange access limitations of removable drives on Android makes them less well-suited for single-folder content storage. Watch for a rehash of this topic when we consider Pydroid 3 at the end of this guide; it becomes crucial for alternative apps. Finally, a bold-font caution: per normal Android operation (described by Android docs here and here), uninstalling Termux also silently deletes its app-specific folders on all your drives—including any content folders you've nested there. Unnested content copies, and unnested working folders in internal storage are immune to this, but those nested on your SD card and USB drives to support Mergeall updates may perish with Termux. Because this occurs without clear warning, it's substantially worse than the prior section's caveat on removable-media accessibility, and further bolsters the case for internal storage. Specifically: on all devices tested, the Android/data/com.termux folders on both the removable SD card (at /storage/xxxx-xxxx) and internal storage (at /sdcard) were automatically deleted when Termux was uninstalled, along with any and all content placed there by a user. On one device, a file explorer also attempted to intervene and delete this content too, but the system apparently beat it to the punch. There is no reason to nest your content in an app-specific folder on internal storage—and a root-level folder on internal storage avoids this issue altogether—but there is no other option for updateable content on removable drives in Termux (or other Python apps we'll meet in Appendix B). This automatic deletion may sound scary, but it's designed to clear associated space when you're done using an app, and really isn't much more dangerous than file-explorer deletions if expected (and an rm command in the Termux shell can be deadlier still). Before uninstalling Termux, though, be careful to move your nested content if you wish to retain it. In Android, uninstalls imply deletions. And that's a wrap on the requirements front. In exchange for all this, Mergeall provides a free and proven incremental backup and changes propagation tool for the content you store on Android devices. Though not for everyone, this Mergeall approach requires neither device rooting nor card extraction—both of which can be perilous, if not impossible—and brings robust cloud-free storage management to your phone. If those benefits offset this section's requirements for your usage—or you just enjoy a technical challenge in general—read on for more on using this package's helper scripts to simplify Mergeall runs on Android. Note from a possible future: If a standalone Mergeall app ever appears, it may obviate the need for both Termux command lines and content nesting in Termux's app-specific folders, but would still incur Android version and filesystem constraints. In particular, barring an exFAT fix, drives would still be best formatted as FAT32 for interoperability. Given the sloth with which bugs are fixed in commercial products like Samsung Android, using FAT32 today is likely not a short-term measure. If you're already using FAT32 drives, the only impact of an app upgrade would be an optional move of content to unnested drive roots. Most of these are one-time tasks and can be performed in a variety of ways, but they should generally be done in the order listed here. The section following this one covers running merges, but assumes the tasks here have been completed. So grab your phone, PC, and drives, and get ready for a bit of admin work. To be able to run Mergeall's Python scripts, you first need a command-line environment in which to run them. The Termux app provides a featured-rich Linux shell for Android that fits the bill; see its homepage for background. To get started, install the Termux app on your phone from the Google Play Store. Mergeall's command-line mode "just works" in Termux, because Android is really Linux under the hood. Using Termux extra keys (or not): Shortly after this guide was penned, Termux changed its extra-keys row to be configurable, but in the process also removed keys crucial to command-line editing (e.g., arrows). To restore the former keys shown in this guide's Termux screenshots, visit this page, and scroll to its "Extra Keys Row" section. In brief: in Termux itself, run a Unix mkdir command to create the new folder ~/.termux; use a Unix editor like vi or nano to make a file named termux.properties in the new folder and paste in the line shown on that page; and restart Termux. Option: some readers may prefer to disable the Termux row entirely and install an alternative on-screen keyboard that has all the important bits, like Hacker's Keyboard. Bonus: such a keyboard may also come in handy for tkinter GUIs run on Android (stay tuned for the details in Appendix B). After that, allow access in the popup that appears. Note that you may need to rerun this command later with removable drives connected, if you get permission errors. This command also creates the required /Android/data/com.termux nested folders on all connected media automatically if they do not exist, but you can also make these manually when you're preparing your drives on a PC (as we will a few steps ahead). If you've forgotten why this permissions step is required (or came here from a search), see the earlier coverage. Also note that Termux commands that update your phone's internal storage from here on in this guide assume that this command has been run; without it, such commands will fail on permission errors. As usual, a Ctrl+d key combination at Python's >>> prompt gets you back to Termux's $ prompt. 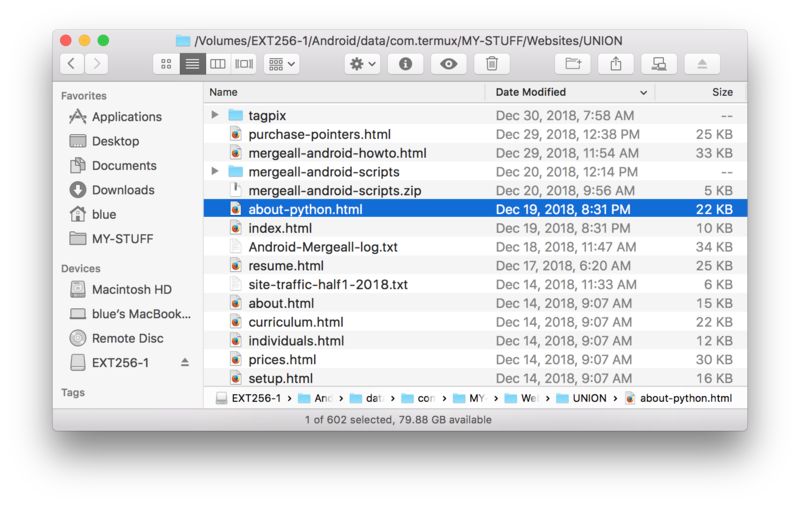 Now that you've got Termux and Python ready to go, it's time to setup a working folder on your phone where you'll run scripts to sync content. This is a simple task, but you'll want to decide up front where you wish to work, to avoid having to repeat steps later. Your Termux home folder known as ~ (which is really files/home in /data/data/com.termux) is writable, but fully app-private: its lack of visibility in file explorers and other apps on non-rooted phones can make maintenance tasks like Bluetooth transfers harder. 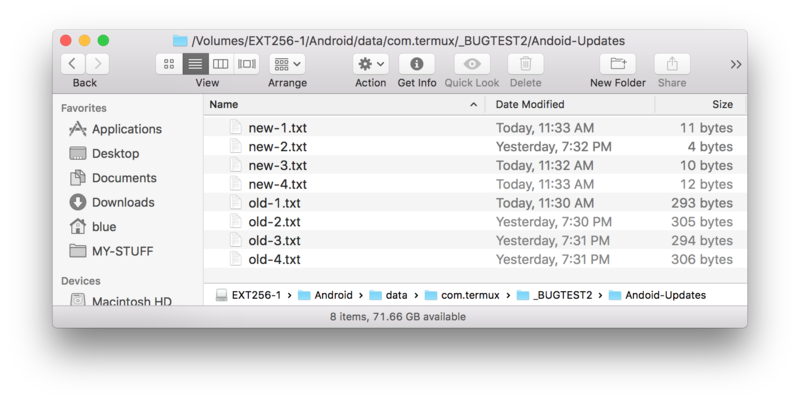 The Termux app's nested folder in internal storage (Android/data/com.termux in /sdcard) might seem a natural too, but it's more to type, and will be automatically deleted if Termux is uninstalled (a broad issue discussed earlier). You can also create this folder in your favorite Android file explorer—one of the benefits of locating it in internal storage this way. Once you've got your folder set to go, you're ready to populate it with software, per the next step on our list. Wherever you choose to work, unzip (i.e., extract) both this helper-scripts package and Mergeall's source code there for convenience. The helper scripts simply augment Mergeall, so you'll need both packages. You can use the standard Mergeall source-code package, because its core syncing code developed for Mac OS, Windows, and Linux works unchanged on Android—a testament to the benefits of portable software (though the story for Mergeall's GUI in Appendix B won't be nearly as seamless). For an example of the resulting working folder, see this screen capture. This assumes that clicking the links above on your phone makes the zipfiles show up in /sdcard/Download, but that's normal Android public-folder behavior. Two tips here. First, if you're new to Unix, be sure to use Termux's arrow keys to recall prior commands to edit and resubmit, and its tab completion to let Termux fill in most of these commands for you. The latter makes command lines much easier to type; for instance, a tab after "m" in the sessions above likely expands it to "mergeall-android-scripts.zip," one after "M" fills in the Mergeall full zipfile's name, and "Dow"+tab expands to "Download" similarly. Don't type what you don't have to type—especially on a phone. Termux has the wget download command too. Regardless of their sizes, Linux-based devices offer an embarrassment of options. All removable drives to be used with Mergeall on Android should generally be formatted with the FAT32 filesystem for best interoperability, and must nest content in their Termux app-specific folders if you plan to update them with Mergeall. These requirements apply to both removable SD cards used for on-phone storage, and USB drives used as intermediaries between phones and PCs. Setup and content copies for both can be done on your PC—an advantage of removable drives. If you opt to store on-phone content on internal storage instead of SD card, it does not require FAT32 formatting or content nesting, but content copies must be done on your phone itself, and your USB go-between drive must still satisfy the prior bullet's rules. Since this is probably the most convoluted of the steps in this list (and is also required of the GUI alternative in Appendix B), the following sections provide a more detailed breakdown by media type. Use your PC to setup the removable drives you'll use on Android. First, you'll need to meet the FAT32 requirement. If your drive is already using FAT32, you can move on to the next paragraph. Otherwise, start by copying any existing Android content on your drive to a temporary location so it can be restored later; this includes existing DCIM (camera) and Android (app-data) folders, if present. Then, format your drive as FAT32, and restore the prior existing content you saved. If you're new to formatting, see the notebox ahead for tips. If you did format your drive, create its /Android/data/com.termux folder now if it does not exist, and copy your content folder there using whatever copy technique you normally use on your PC (e.g., file explorer or command line). If you did not format your drive, create its /Android/data/com.termux folder now if needed, and either move your content there if it's already located elsewhere on the drive, or copy it there anew. A caution here: you can move existing content in a file explorer too, but be sure a move in yours is a true move, and not a copy-and-delete. The speed difference can be staggering for large folders, and some Android file explorers may miss the mark on this. The link (or shortcut) is optional, but can save a lot of navigation time in file explorers, and typing in command lines. The root-level link probably won't work on Android, and you can't create one for removable drives on non-rooted phones because you don't have the required permissions on removable drives (this is the whole reason for nesting content in the first place); but it can save steps on PCs. On Android, instead make a home-screen shortcut (that looks like this) to your content folder; a longpress in your file explorer is the usual first step. This makes more sense for a resident SD card than a transient USB drive; but because your content is now six levels deep when viewed on Android—nested in the Android/data/com.termux folder of your drives' /storage/xxxx-xxxx root—the shortcut can save a whopping five taps per access, plus a file-explorer open. If you're able (or required) to store your on-phone content in internal storage, you don't need to reformat as FAT32 or nest your content in the Termux app-specific folder. In fact, you shouldn't—internal storage is already formatted, and nested Termux app folders disappear on Termux uninstalls as noted earlier. Instead, simply create a folder for your content at the root of internal storage, and copy your content there. Both these steps must be done on your phone itself. Then, copy your content to your phone. For most users, this will employ an intermediary USB drive: copy from PC to USB drive, then from USB drive to phone. A content copy on a USB drive you've already setup for Android in the prior section will suffice, and avoids another step. A caution here too: on the phone, you can run the copy to internal storage in most Android file explorers, but some fail to copy over file modification times. At least one popular app, for instance, simply stamps every copied file with the current time, which is a showstopper for Mergeall—and no better than the pre-Oreo Android bug (in fact, this may be a lingering accommodation of it). Here too, once the content copy finishes, you may wish to create a home-screen shortcut to its new location on your phone. In this mode it's only two levels down in internal storage when viewed on Android—at /sdcard/MY-SYUFF—but the shortcut still saves one tap per access, plus a file-explorer open. A symlink doesn't make sense here, because it would be two levels down too (and may be impossible in any event: a ln -s at Termux's prompt didn't work for /sdcard, despite having write permissions there). A reminder: even if you use internal storage for on-phone content, you'll also need to setup a USB drive to propagate changes between your PC and phone (or save on-phone changes in general). That removable drive will still require FAT32 formatting for interoperability and content nesting for updates as described earlier (here and here), and can be used to initially populate your internal storage with content. Your on-phone content, though, is substantially easier to setup and use. Tips on formatting your drives: As noted, you'll generally need to reformat your removable drives unless they already use FAT32, and this isn't a trivial task if you're new to it. On Windows, the standard file Explorer won't format larger drives as FAT32 (it forces exFAT instead), but a DOS format command and third-party options will; for pointers, try this search and this thread. 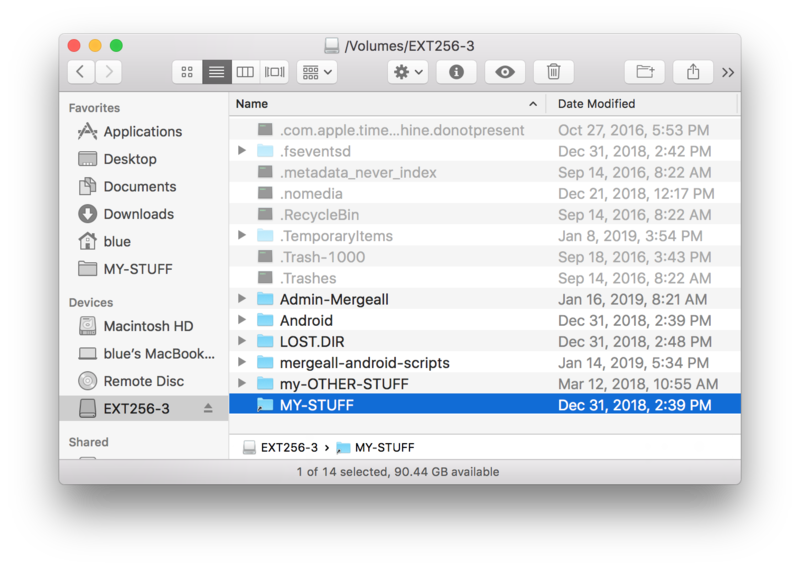 On Mac OS, the Disc Utility app's Erase happily formats larger drives as FAT32 (if you select this and use uppercase drive names), and Linux users have many options. Android itself can format drives too (see your drive's Format in Settings ⇨ Device maintenance/care ⇨ Storage ⇨ Storage settings); unfortunately, it seems to silently choose FAT32 or exFAT for you based on drive size (a case of user-friendliness gone bad) so you'll have to use a PC for larger drives. On all platforms, the usual warning about formatting applies: it erases your drive, so copy off anything valuable first. You may also want to add a .nomedia file at the top of reformatted removable drives that will be duplicates of the content kept on your phone (e.g., on a go-between drive that will be used to propagate changes between your phone and PC); where it works, this "hidden" file prevents Android's media scanner from searching the redundant copies. Last but not least, you'll now install and edit the bash profile file shipped in this package. This must happen last, because you may not know the Android names of your drives until they've been prepared and attached to your phone. Formatting, if run, changes the IDs Android uses to identify drives, and you'll need these IDs in this step. Along with its scripts (and this guide), this helper-scripts package includes a prototype bash profile file named your--.bash_profile. This file has simple settings that provide quick access to your Termux home and working folders, as well as your content-copy directories on your phone and removable drives. You can view this file's contents here; it's mostly documentation (the lines that start with a #). For example usage of this file's settings at the Termux prompt, see this Android screen capture (and zoom in and zoom often). The bash profile file is also integral to using the helper scripts here: per the next and final setup section, it defines Android paths in a single location shared by all. To make both commands and edits easier on smartphones, the helper scripts in this package use common content-copy path variables set in your bash profile file. This way, paths need be changed in that file only, and only when you first install this package or wish to use a new drive. This runs source to load your new settings after you're done, and uses the Unix vi text editor. If vi is too cryptic for your tastes, the more user-friendly and WYSIWYG nano text editor also works in Termux after a pkg install nano. You can also rename and edit the bash profile file on your PC and beam it over, but you'll still need to copy it into your home folder in Termux, because that folder is visible nowhere else. Special cases: if you opt to use internal storage for your on-phone content copy instead of SD card (per the requirements section earlier), use the profile file's /sdcard/MY-STUFF data-path setting instead. You may need to also edit the scripts themselves to configure for your Mergeall source-code package's install location if it's not in . (the current working directory), but this is not required if Mergeall's package is unzipped to the same folder as this scripts package. Because removable drives are identified by drive IDs in Android, the paths used by helper scripts will change if a new removable drive is inserted. To reconfigure for a new drive, simply update paths in your ~/.bash_profile with the editing commands above; all Android helper scripts automatically source (i.e., reload) this file on startup, so they always use its current settings. You may also need to rerun Termux's termux-setup-storage when changing to a new drive; if you get permission errors, this applies to you. Helper-scripts coding notes: The symlinks made at drive roots by the Mac OS move-and-link script here might suffice for pathnames in other scripts, but these links won't generally work on Android, and non-rooted phones don't have permission to make such links in removable drives on Android itself. Termux's ~/storage/external-* links also record drive paths, but they seem too ambiguous to use: they give IDs but not drive type, and are not always current. Instead, the helper scripts rely on the manual $data and $plug settings in your bash profile file, both for generality, and because explicit is usually better than implicit—especially when your content is at stake. After you've performed the prior section's setup requirements, you're finally good to go: whenever you wish to sync and compare your content, simply run the helper scripts and other command lines described in the sections that follow. There's generally no reason to repeat setup steps (unless you wish to use a new drive), but the commands here can be rerun anytime you wish to propagate changes to or from your phone. Additional scripts run modification time (a.k.a. modtime) adjustment tools for FAT32 drives, and other Mergeall utilities are available as standard Unix command lines. As a bonus, all the Android helper scripts here automatically save logfile output to your working folder's Admin-Mergeall subfolder, using filenames either passed or generated; to see how this works, let's jump right into the available commands. The bash command just tells Termux to run all the precoded commands in the chosen file, and scripts' filenames imply their action. For instance, plug-to-data in this script's name syncs changes from USB drive to on-phone storage, and update means apply changes to the destination automatically; data-to-plug syncs the other way, and report means report differences only without changing anything. Worth reiterating: be sure to use shell tab completion to fill in the folder and script names in these commands; in this case "bash m+tab/m+tab" is most of the command. Optional: scripts located in your Termux home folder (~) can also be made more directly executable with a chmod +x scriptname.sh and run with just a scriptname.sh; in Termux this works for home-folder scripts only, not for working folders located elsewhere. Whether the logfile name is passed or generated, the logfiles subfolder is created automatically if needed. As a guideline, you should run this comparison script occasionally to ensure that all files in your content copies are completely identical. Though Mergeall's time-and-size comparisons are fast and adequate for your day-to-day syncs, drives can and do go bad eventually. A byte-for-byte check proves the integrity of your content—albeit much more slowly (read the notebox ahead for details). For a more graphic look at the Mergeall sync and diff helper scripts in action on Android, check out the Mergeall-run screenshots with and without tails, and the exemplary but heavily redacted Mergeall and diffall.py logfiles. And for a comprehensive test that verifies the approaches laid out in this document, study the files in this folder, especially its test notes. Speed matters: Though most phones would lose a straight-up footrace with a PC, on Android, Mergeall itself is relatively fast because it compares just file timestamps and sizes by design. The more exhaustive diffall.py utility, though, can run much longer for large content collections—which is one reason for using incremental sync tools like Mergeall (though even-slower full copies make it a slam dunk). As an example, on-phone comparisons of a 150G content collection having 100K files and 10K folders on microSD and USB flashdrive work well, but take 2 hours in diffall.py versus 2 minutes or less in Mergeall. For long-running tasks like the former, be sure to acquire the Termux partial wake lock in Android's notifications to keep your program running even after your screen blanks. Remember to release it when your task finishes to avoid battery drain. And for true sports fans: the Mergeall comparison for the same 150G content folder on the same drives clocks in at a quicker 24 and 54 seconds on Mac OS El Capitan and Windows 7 machines, respectively—though the variables are many, and 2-minute on-phone merges still beat microSD-ectomies. Update: results for internal storage are now in. On the same phone, and using the same USB flashdrive and 150G content collection, Mergeall and diffall.py comparisons to internal storage run in just 19..43 seconds and 29 minutes, respectively. This is 3 to 4 times faster than microSD's results of 66..121 seconds and 2 hours on these tasks. Surprisingly, the cpall.py script copies the full 150G from USB to internal storage in just 21 minutes—slightly faster than a diffall.py comparison, and perhaps indicative of a USB port and/or drive that's a bigger bottleneck than internal-storage write speed. Either way, internal storage takes the gold in the on-phone content sprint. Additional helper scripts in this package run Mergeall's fix-fat-dst-modtimes-data.py to adjust file modification times on FAT32 drives so they are in sync with non-FAT drives after daylight-savings-time (DST) changes. Because FAT32 is recommended for broadest interoperability on Android today, you may need to run this utility twice a year, especially if you propagate changes to or from a PC or your phone's internal storage. Without getting into all the details here, on DST rollovers, FAT32's local times may all be one hour off from the UTC-based times used on non-FAT drives. To diagnose this state, run Mergeall in report-only mode (its reams of messages will show every file differing by modtime), and inspect the times of the same file on both drives (they'll differ by one hour). Less than ideal, perhaps, but cross-platform content management is never dull. If your on-phone content is in internal storage, run the fixer script on your FAT32 USB drives only. On devices tested, internal storage uses UTC times just like PC internal drives, so updating an intermediate FAT32 USB drive will bring it in sync with both your PC and your phone. If your on-phone content is on a removable SD card formatted as FAT32, run the fixer script on both your FAT32 USB drives (to match your PC's UTC times), and your removable SD card (to match your intermediate drive's fixed times). If you use Mergeall for incremental backups only and never propagate content to or from a PC, a FAT32 USB drive must still be adjusted to match UTC-based internal storage or an exFAT-formatted removable SD card, but need not be adjusted to match a FAT32 SD card. If you format your removable drives as UTC-based exFAT (despite the earlier advice), they need not be adjusted to match UTC-based internal storage or exFAT-formatted SD cards, but an adjustment is still required to make an exFAT USB drive match a FAT32 SD card. On caution here: you should generally restart your phone before syncing content to it after a DST rollover. Otherwise, Android may return file times saved earlier in a cache that are now invalid, and will not compare correctly to other files' times. This is arguably another Android bug; without a restart, its net result may be spurious differences or equivalences, either one of which can derail Mergeall syncs. For example, after adjusting times on a FAT32 USB drive up by an hour at a recent DST rollover (March 2019 in the US), Android initially and erroneously reported all the drive's times as differing from those on UTC-based internal storage; a phone restart sufficed to make the drive's times agree with internal storage as expected. Restarts may or may not be required for on-phone content on removable drives: at the same DST rollover, FAT32 USB agreed with FAT32 SD and exFAT USB agreed with exFAT SD—without restarts. To be safe, though, restart to prevent Android's error-prone caching from causing problems. Mergeall's source-code package also includes the cpall.py folder-copy script, and its test subfolder includes the ziptools package which comes with zipfile create/extract scripts. If you elect to host your content on your phone's internal storage instead of a removable card, for example, you might use either of these to copy your content folder in full from a USB drive initially, or export it to USB later. As usual, tab completion helps with input here, and bash scripts, variables, or aliases can shorten such commands. For more on using cpall.py, see the script; for more on ziptools, see its homepage. Termux itself comes with a Unix unzip and a pkg install zip adds a Unix zip; both generally work well, but are naturally subject to the Unix tools' constraints (e.g., file-size limits may apply). And if you can imagine typing this all on a smartphone's touchscreen, you'll probably appreciate why the helper scripts may be a better idea. This section collects assorted usage pointers and reminders. Most are intended for users newer to Termux, Unix, or both. In closing, if this Mergeall approach seems like a lot of work, it's because it is, but it's also a price inherent in maintaining content on Android smartphones with Termux command lines today. In exchange, this scheme provides a fully functional incremental-backup and changes-propagation tool that you can run directly on your Android device to synchronize with external drives—no device "rooting" or card juggling required. That being said, some users of both Mergeall and Android may prefer to remove cards instead of using command lines, and this may be the only option for others. Still, any scheme that can free your content from the constraints of both closed devices and cloud storage is worth a look. Not only are storage devices much quicker than clouds, they can automatically neutralize the proprietary and even exploitive agendas that seem to underlie much of today's smartphone experience. However you choose to proceed, taking control of your digital property is worth the effort. This appendix introduces and summarizes the folders used in this guide. It's probably more useful to readers who haven't used command lines much in the past, but also serves as a glossary of sorts. This folder is really located in internal storage, but is too hidden to be accessed as such. Being Linux-based, Android uses the / character to separate folders in a pathname like this; the one all the way to the left means the device root (the top of the folder-nesting tree), and the left-to-right order of /-separated names gives their nesting. This is where you normally "are" when you first open Termux (before you run a cd to go to a different folder). It also goes by the names ~ and $HOME, which are just shell syntax that automatically equate to this folder's full pathname above. Because you can't see this folder outside the Termux app, its scope is limited. Because of the way Termux works, though, this is where you'll need to install and edit the bash profile file covered in this guide. Your drives' IDs will differ (they're supposed to be unique, after all), and you can find them in some Android file explorers after drives have been attached (and the system has a chance to mount it in the folder-nesting tree); see earlier for app pointers. A physical drive's ID will change if it's reformatted, but should otherwise remain constant. Every app has one of these folders if it needs one; they also appear in internal storage, and are meant for app-specific content that might be too large or inconvenient to store in the /data app-private folder. As discussed in this guide, these app-specific folders are key to using content on removable drives in Mergeall—whether from Termux command lines, or the GUI of the next appendix. App-specific folders like these are also automatically and implicitly deleted when the owning app is uninstalled. This is meant to clean up an app's resources, but makes these folders subpar for storing data. Because of that, you'll generally locate your working folder elsewhere. Your Mergeall content would ideally be elsewhere too, but updatable copies on limited-space phones may have no other option than removable storage, and this requires app-specific folders today. Also keep in mind that the pathname forms above and used in this guide may vary on some Android devices, and have varied over Android's history. For instance, /storage/extSdCard and /storage/sdcard0 worked in the past too. The paths used here reflect Samsung Galaxy devices using Android Pie, Oreo, and Nougat, so you'll have to translate if those on your phone differ. Alas, Mergeall's budget is limited, and stability is not among Android's core virtues. For more details on Android pathnames, see books, the web, or other Android resources. The main part of this guide recommends and covers running Mergeall by using command lines in the Termux app, because this approach is both straightforward and reliable, and is completely advertising and payment free. Termux provides a free, full-featured. and general-purpose Linux environment, which can run Mergeall's command-line mode with minimal setup tasks and robust performance. This is not, however, the only Python-on-Android game in town. Most notably, the Pydroid 3 app has recently acquired some rudimentary though impressive support for using the Tk GUI library—and Python 3.X's tkinter interface to it—in Python programs. This makes it possible to use Mergeall's GUI on Android devices today, along with a host of other existing tkinter software. Less positively, this app's tkinter support also comes with substantial downsides, including both behavioral glitches and unfortunate advertising, that make this approach difficult to recommend in this guide. That being said, the prospect of running PC GUIs on a smartphone is arguably seductive, and the possibilities that this app raises for Mergeall users merit both fair review and your own judgement. You may or may not prefer Pydroid 3 GUIs to Termux command lines in the end, but this appendix provides enough coverage of the former to help you make a good usage-mode choice. Versions note: The findings in this appendix reflect Pydroid 3 versions 2.22 and 3.0, Python versions 3.6 and 3.7, an Android port of Tk version 8.6, and Android versions 7 though 9 (Nougat, Oreo, and Pie). All four of these systems play roles in issues noted along the way. While this how-to hopes to be revised for fixes in these systems, change is constant and rapid in the software world. If you're reading this in the future, be sure to check all three for current status. With any luck, the glitches list here will be completely invalid by the time you see it. You can also view the screenshots above in slideshow mode here. Despite the tradeoffs we'll explore in this appendix, it's important to note that running tkinter programs this way is an enormous achievement, given the large disparities between PC and Android platforms. Fullscreen mode saves space by hiding the Android top-of-screen status bar. But it may cause conflicts with Android's notifications pulldowns whenever you tap near the top of the screen (especially when trying to move windows with touch). Maximized mode uses space well by expanding the first-launched window to fill the entire display without a window border, and automatically resizes the window to fit the new aspect ratio on each rotation. But it doesn't work for persistent popup windows (they're overlaid and hidden), and is dangerous or unusable for programs that need to process or verify exits (the double-back tap alternative to a window-border's "X" exit button does not run program exit handlers). Nevertheless, Mergeall seems to work best with both these modes enabled, because it has no persistent popup windows and doesn't need to catch program exits, and because screen space is a precious commodity on phones in general. Mergeall works without these modes too—and looks like the last set of screenshots above—but has less space, and may bear manual resizing which seems out of place on a phone. There is no window manager, apart from the IDE's canvas: multiwindow programs and window resizes are supported, but there is no minimize, and the IDE can run only one program at a time. As shipped, rightclicks are drive-by swipes instead of press-and-holds or mouse rightclicks. In programs that support it, either swipe with touch or stylus, swipe with a mouse cursor while holding its left button, or use a control-key + mouse-click combo with a Bluetooth keyboard. Some smaller controls are difficult to operate with touch alone, and may benefit much from a stylus, mouse, or two-finger spread/pinch zooms which expand/shrink the view generally and three-finger pans which scroll zoomed views. Window resizes and moves for multiwindow GUIs run in non-maximized mode are frustrating to perform with touch, and nearly impossible without a stylus or mouse (or the patience of a saint). Some larger GUIs may warrant, if not require, landscape orientation for better fit, maximized viewing mode to avoid horizontal slides, and navigation bar hiding and/or fullscreen mode for extra space. Though subjective, most tkinter GUIs reflect their PC heritage, and some of their cosmetics may seem foreign to users accustomed to apps designed specifically for smaller Android devices. On the other hand, tkinter GUIs are surprisingly usable on a phone with practice—and might even be compelling. Is that an AndroWish under the hood? : Programmers may be interested to know that the Pydroid 3 app's tkinter support might be based on the work of AndroWish—an open-source project that uses the SDL graphics library to render Tk GUIs on Android devices, employs a JNI bridge between Android's Java code and Tk's C code, and was itself based on an earlier project called SDLTk (whose web whereabouts are unknown). If so, this means that Pydroid 3's tkinter simply inherits both its utility and flaws from AndroWish, though the Pydroid 3 commercial product also shares responsibility for the software it bundles and sells. Unfortunately, Pydroid 3's developer did not reply to requests for verification of AndroWish use. To be sure, Pydroid 3's tkinter bears multiple signs of AndroWish-ness. Among them: its two-finger zooms and three-finger zoomed pans work in AndroWish too; its unique rightclick bindings smack of AndroWish's sdltk touchtranslate command; its GUIs-cannot-spawn-GUIs constraint discussed ahead also exists in AndroWish; its tendency to fire multiple events for one gesture parallels an AndroWish bug report; its install tree includes SDL components used by AndroWish; and its overall look-and-feel seems the same as AndroWish's. Still, this isn't enough evidence for a positive identification. What can be said is that Pydroid 3's tkinter is likely based on work of others that is not necessarily tied to Pydroid 3, and might be usable in other Python coding apps, in standalone apps of your own, and even on other platforms. While intriguing, such prospects are both beyond this guide's scope, and largely moot. The more important point here is that Pydroid 3 today brings Tk and tkinter on Android to the broad Python audience—something that the Tcl-biased AndroWish project seems unlikely to have ever pursued. Hence, we'll attribute Pydroid 3's tkinter to Pydroid 3 here because it's no less a part of this app than any other component it embeds, and note that running tkinter GUIs like Mergeall's on Android is a stellar achievement, regardless of its implementation. Compared to the Termux approach, you do not need to install Python separately (it's part of Pydroid 3); install helper scripts (you'll use the GUI instead); or run a permissions setup command (Pydroid 3 requests permissions automatically). However, you still need Mergeall's source-code package (you'll run its GUI's script); must patch two of its code files for Pydroid 3 alone (per the next section); and still have to work with Android version, filesystem, and permission constraints (per their earlier coverage). While some of the steps above are self-explanatory, and we don't have space for an exhaustive dissection of the rest, the remainder of this appendix explores the most-salient points on the list above. Among the requirements just listed, the third may merit explanation most. To use Mergeall's GUI in Pydroid 3, you must first download Mergeall's source-code package from this page to any writeable folder on your phone, and unzip (i.e., extract) it there. Internal storage's /sdcard/Download is the usual target for downloads, and will suffice for both a quick look and later syncs. There's more on Mergeall's source-code package here and here if you've jumped into this appendix randomly. If you click these links online, you'll receive reply pages that looks like this; download to your phone by clicking the "save" in these pages' "Raw text" lines. If you're working offline, try a rightclick/longpress save, or visit the folder these links reference. The changes applied in these files are minor, and apply to Mergeall's GUI only. Hence, they won't break Mergeall's command-lines mode described earlier in this guide if it's run from the same modified source-code folder. Conversely, these changes will break Mergeall on PCs, so use the files above only on your phone's copy of the source-code package. All changes made are marked with "# ANDROID" comments; search for this string in the custom files if you want to see what differs on Android. In short, these files' changes address some but not all limitations of tkinter GUIs in Pydroid 3. For example, text labels were trimmed and control fonts shrunk for better fit; some size settings were lowered for non-maximized mode; a workaround was installed for a Pydroid 3 sys module glitch that prevented the GUI from spawning merges; other workarounds were installed for Python webbrowser issues that precluded document views; a button was decolorized to avert color loss; and later releases added dialog-text breaks, folder-choice prefills, and read-only text state, to avoid message truncation, chooser dialogs, and keyboard popups, respectively. Despite all the changes applied for Android, though, you must still avoid using some fonts in customizations because they trigger crashes prior to Pydroid 3 3.0 and force blind choices later, and should not rotate some devices while Mergeall is running because this can hang or kill Pydroid 3 altogether. We'll take a closer look at these and other glitches in Pydroid 3's tkinter GUIs in a moment. First, though, let's run the GUI. Once you've made the prior section's code changes, start Mergeall's GUI by opening its source-code package's file launch-mergeall-GUI.pyw in the Pydroid 3 app's editor, and pressing the editor's big yellow run button. 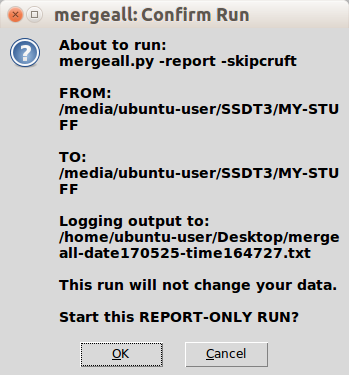 Mergeall's GUI should appear, and work the same as it does on PCs and as described here—select FROM and TO folders, choose a REPORT or UPDATE, pick a logfile folder and other run options, and press the GUI's GO button to sync. Mergeall messages scroll in the GUI, and are saved to a logfile if you've requested one. As usual, you can open Mergeall's source-code file in either Pydroid 3 itself (see its folder icon), or most Android file explorers (tap the file and open with Pydroid 3). As noted earlier, Mergeall tends to work best in fullscreen and maximized modes. If desired, select these modes before running the GUI with the Settings ⇨ System dialog, and press your phone's back button twice when you wish to exit Mergeall in maximized mode. While you're in Pydroid 3's Settings, also consider using the Editor's monospace font without line wrapping; Mergeall's code is otherwise difficult to view. Viewing code is not required for the GUI, but you may wish to experiment with configuration-file settings in mergeall_configs.py, and the line between user and programmer is often gray at best. This GUI approach works, but only for Mergeall syncs: other Mergeall tools like diffall.py comparisons and cpall.py bulk copies have no GUI, and are still best run with command lines in the Termux shell as covered earlier. Pydroid 3 does have a Terminal option that is capable of running command lines too (and can even run the main Mergeall script with a command typed manually), but it's much more limited than Termux for command-line work. And while you can open and run such scripts in Pydroid 3's IDE, they won't work because the IDE has no way to specify the command-line arguments they require. As a special case, running Mergeall's GUI to sync to an empty folder has the same effect as cpall.py (and in fact uses the same code), but you won't get as many status messages, and there's no GUI equivalent to diffall.py today. Command-line scripts need command lines (or an IDE that supports them). 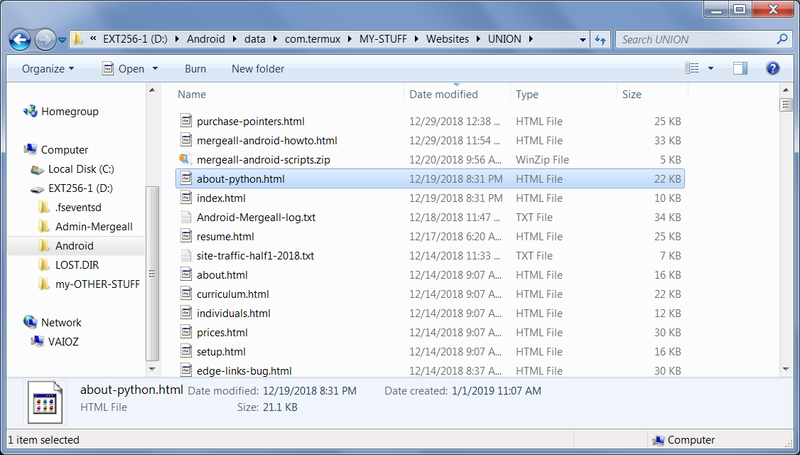 Run GUIs faster with shortcuts: Opening and running a source-code file in Pydroid 3's IDE normally requires multiple steps—you must either open the app and navigate to your file, or navigate to your file in a file explorer and open with the app. This, plus clicking the IDE's run button, makes for substantially more steps than either a command in Termux or a standalone app (and is one reason this guide downplays the GUI option). That said, some Android file-explorer apps allow you to place a shortcut (a.k.a. link) to a source-code file on your home screen, like this and this. Once placed, starting a tkinter GUI program like Mergeall in Pydroid 3 is just two taps—click the shortcut, and click the IDE's run button. Pydroid 3 still has extra setup steps and glitches, but running a tkinter GUI can be nearly as easy as running an app. Usage notes: file explorers here and here are among those that make links, and be sure to set your file's default app or command to be Pydroid 3 in your file explorer (unless you like surprises more than monkeys). Some PC GUIs may be too large to fit well in the smartphone form factor, and require changes to avoid widget truncation in maximized mode, or horizontal slides in non-maximized mode. In Mergeall, this meant trimming text labels and shrinking control fonts for better fit on smaller screens, and lowering some preset size configurations for non-maximized mode (though they're irrelevant at maximized size). Getting the fit right for smaller phones can be difficult. For example, because Pydroid 3's tkinter naively clips nearby widgets instead of truncating the text of labels that don't fit, Mergeall's original and descriptive PC-GUI labels were initially unusable on phones of all sizes, and had to be trimmed radically for use on screens as small as 5.5" (and may still be too wide on even smaller displays without new user configs). More-sophisticated tkinter GUIs may naturally require more redesign work, though shrinkage is limited by usability (Mergeall might someday run on your watch, but it probably shouldn't). Font support in Pydroid 3's tkinter is weak enough to ensnare many PC GUIs, including Mergeall's. In general, font-family names courier, times, and helvetica work (and monaco is courier, and arial is helvetica), but most other font family names trigger an immediate and silent hardcrash (including system). Moreover, font sizes work as expected, but italic and bold font styles are simply ignored if used for courier (though they work for other font families). To test this for yourself, edit and run this file in Pydroid 3. Mergeall avoids crashes with font presets tailored for Pydroid 3 to use only supported fonts, but this constrains functionality, and is error prone in the context of end-user settings. You can still tailor its fonts in the configurations file, but customize with care (and see this file for names to use with platform-specific settings like fonts). Update: Pydroid 3's 3.0 release in early April 2019 fixed its font crash by coercing any unknown font-family name to helvetica, but all of its font limitations described above are still present. That is, unknown fonts no longer crash GUIs silently, but helvetica is substituted blindly, and no additional family names (or courier styles) are now supported. It's a fix of sorts, but the app's tkinter clearly requires more font work. Even more glaringly, on some devices, rotating the screen between portrait and landscape orientation while any tkinter program is running either kills the GUI immediately and silently, or fully hangs the Pydroid 3 app so badly that it must be forcibly killed and restarted. Whether you get a kill or hang depends on which GUI you run, but both effects are clearly less than ideal. Due to testing constraints, the exact scope of this issue is unknown. It has been observed on Samsung J7, S8+, and Note9 devices running Android Nougat, Oreo, and Pie. On the more recent Samsung Note9, however, rotations in Pydroid 3 tkinter GUIs work fine in both Oreo and Pie after changing the display's screen-zoom setting from Small to either Medium or Large. This doesn't help on the older phones, though, and it's unclear if the older phones may benefit from applying system updates. It may also be possible to work around this in Mergeall with a Java-based approach that locks orientation or ignores rotation, but this would reduce utility drastically (rotation can be an essential tool when space is limited), and the underlying bug should really be fixed globally for all programs. Ultimately, only Pydroid 3 tkinter GUIs exhibit this defect. For now: if rotates don't work in tkinter GUIs on your device, either make sure your screen zoom is not Small and your device is up to date; wait for a fix in whatever software plays Brutus to Pydroid 3's rotation Caesar; or use Mergeall's GUI in either portrait or landscape orientation—only—and consider a rotation-locker app like one of these if you can't avoid flipping your phone. In the same department as the prior note, changing phone orientation during a spawned activity may cause a running Pydroid 3 tkinter GUI to slide off screen, or hang similarly. Slides happen even on phones that support GUI rotation in general, and have been observed after rotating both Shares and document handlers opened by the GUI (e.g., web-browser help displays). Rotations are clearly a Pydroid 3 tkinter problem area; as a workaround, rotating twice generally restores a slid GUI—but only on devices that support GUI rotation. Python's webbrowser module for opening web pages and other content generally works in Pydroid 3, because the app presets the BROWSER environment variable to an Android am activity-manager command-line template; when spawned, this template opens documents per the Android default-apps model. See the module's documentation for more on why this works, and this script for a demo of the technique. It's similar to open and start commands on Mac OS and Windows, respectively; on Android, chosen viewers run in parallel with their opener, and a back tap returns to the spawner immediately. Documents can also be opened with Python's os.system and the BROWSER setting, but that apes what webbrowser does automatically. Even so, webbrowser is weak enough on Android to classify as a glitch (and initially warranted disabling widgets that rely on it). For one thing, it requires local-file URLs to use a file:// prefix on Android, unlike any other platform—and silently fails to open if this is absent. For another, Android's default-apps model is not as functional as file associations on other platforms, and reliance on this limits webbrowser's utility: as tested, text files open with few and unconfigurable handler options, and local HTML files open as raw HTML in a text editor instead of being rendered by a web browser. Barring an unknown Android trick, opening HTML in a web browser requires an http:// server URL, which limits HTML documentation to online use only. In Mergeall's GUI, these limitations impact the "Help" and "Popup logfile?" buttons, which display the user-guide HTML and run-results text, respectively. These widgets were disabled in earlier releases requiring users to open documents outside the GUI, but now work as well as they can. To work around the local-HTML issue, Mergeall now opens its user guide by remote URL; this requires online access, but has the advantage of always displaying the most recent version (HTML documents tend to change as frequently as web browsers). To display logfiles properly, Mergeall now uses file:// prefixes to open per the default apps on your devices; this may sometimes be too limited to be useful, but it's better than disabling the feature altogether. These workarounds were also adopted on Android by other programs mentioned in this guide, all of which now open their help and other documents from within their GUIs, just as they do on PCs. For coding details, see Mergeall's patched files, as well as those of Frigcal and PyEdit described here and here. Caveat: given webbrowser's limitations, Android users might still be better served by manually opening documents in some cases. Caution: per the prior note, Pydroid 3 tkinter GUIs may slide off screen or hang if phone orientation is changed during a spawned activity; rotate twice to restore the GUI where possible. Update: this story was rewritten in light of new findings in mid-April 2019, but was modified yet again by new bugs discovered later in Pydroid 3's 3.0 release—a plot element large enough to warrant its own coverage in the next note. The app's 3.0 release now sets the DISPLAY environment variable in tkinter GUIs, which breaks webbrowser—the module assumes an X11 context, and triggers a permission-error exception when calling tools in Python's subprocess module to query xdg-settings. See the new exception here. This happens during browser registration, and before the BROWSER setting of the next bullet can be applied. The app's 3.0 release has changed its BROWSER environment-variable setting to run an odd custom script that special-cases Jupyter file:// documents and bypasses webbrowser—but also senselessly refuses to open any other file:// URLs, exiting silently instead. To see this biased hackery for yourself, run echo $BROWSER and more `which mybrowser` in Pydroid 3 3.0's Terminal; it intentionally breaks other local-file URLs for the sake of a Jupyter munge. Luckily, there are at least two coding workarounds for the damage to other programs: manually unset DISPLAY to reenable webbrowser in general and reset BROWSER to its pre-3.0 activity-manager command for file URLs; or avoid this module altogether by spawning the activity-manager command with os.system (again, see this demo). All former webbrowser clients here were updated to use the latter scheme because it leaves environment settings intact for other Pydroid 3 use cases. Perspective: although this workaround suffices for now, this episode puts the app's viability as a host for application programs like Mergeall on shakier ground. The tale of this bug has been rewritten multiple times here already, and new webbrowser failures introduced by a prejudiced "upgrade" of Pydroid 3 seem to tip the scales well towards unusability—especially given the lack of notification to paying customers. At some point, subjective instability can be neither documented nor accommodated. That point may remain uncrossed, but it's clearly in sight. While not a Pydroid 3 flaw and irrelevant in Mergeall, Python's multiprocessing parallel-execution module does not work on Android, because required semaphores are not supported on this platform. The impact of this will naturally vary per program. PyEdit's Grep command, for instance, depends on this module on PCs to run searches in parallel with the GUI; while it can be easily configured to use fully supported threads on Android instead, doing so makes it impossible to leverage multiple CPU cores—a speed factor whose significance on phones is unclear. Moreover, PyEdit benefited from preexisting code that leverages the API similarity of threads and multiprocessing; other programs may require more extensive recoding. Mergeall's GUI runs the main work of merges as a separate process by design (this lets you run merges outside the GUI too). Oddly, Python's sys.executable is left empty by Pydroid 3, which in turn makes the subprocess.Popen process-spawn code in Mergeall's GUI fail. Mergeall works around this by hardcoding this setting to use the path to Pydroid 3's Python, but this should be fixed in Pydroid 3: this same bug crippled most of the larger programs tested, though some other programs' spawns were also hobbled by the next issue. The workaround's change also applies to the Pydroid 3 app only, which makes it impossible to integrate into base files (more on this ahead). Update: Pydroid 3's 3.0 release in early April 2019 did not fix its sys.executable bug (this setting is still empty), but it did manage to arbitrarily move its Python executable—and break Mergeall's workaround to this bug in the process. See the new exception here. Mergeall's workaround addressed this in its April 19 patch-code release, by using the result of a spawned which python shell command for hardcoding, instead of former or current paths to Pydroid 3 Pythons (see the demo code). The result is release and path agnostic, and will hopefully be immune to future morph in an app that seems more prone to change irrelevant packaging structures than fix reported bugs. Though it doesn't impact Mergeall, tkinter GUI programs can spawn other tkinter GUI programs in Pydroid 3, but the spawned programs' windows never appear for reasons unknown. Both Frigcal's and PyGadgets' launchers, for instance, start programs that run (e.g., they can write to files) but remain invisible, even though Mergeall's GUI successfully spawns a non-GUI process the same subprocess way after the prior note's patch. This is fatal to programs like PyMailGUI that cannot be used without their launchers and cannot be easily recoded to use top-level windows instead of freestanding processes (more details here). While its exact cause remains a mystery, this restriction may be inherent in Pydroid 3 if its tkinter structure requires programs to be run by its IDE. Tellingly, tkinter programs also fail if run from Pydroid 3's own Terminal interface, and the IDE seems to scan specially for specific import statement forms that enable GUI support (see the next note). Moreover, AndroWish—the most likely underlying Tk implementation—appears to have similar constraints. If a workaround exists at all, it is hidden so well that it's effectively nonexistent. Pydroid 3 must see a script's tkinter import or from statement on a line all by itself, or the script's GUI won't work (the required scaffolding appears to be unloaded). This didn't require a change in Mergeall, but the PyToe program in PyGadgets did not open in Pydroid 3 until such a specific statement was added to its top-level script. Though less common, you may also need to add a tkinter import statement to programs that load and run tkinter code from files dynamically; an import in the loaded code won't be enough to enable tkinter support. And now for something completely unnecessary: Pydroid 3's editor has a hard—and arguably naive—limit on the sizes of files it can open, and won't even warn you when the limit is breached. Instead, if you open a flawless script whose source file is larger than roughly 256K bytes (or 5K lines), its runs will fail with Android error-message popups stating that Pydroid 3 has stopped; exiting the script's GUI may exit Pydroid 3 altogether; and the Pydroid 3 IDE itself may start failing randomly but regularly with the same messages. 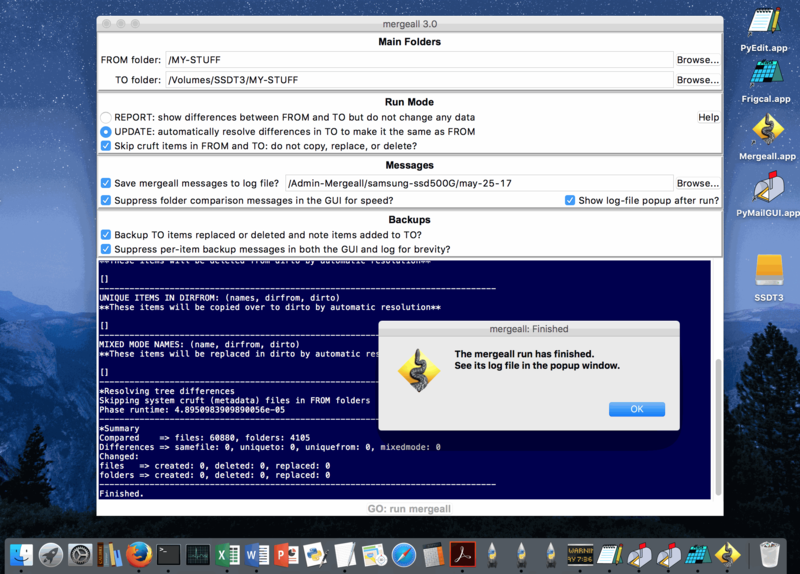 It's unclear if bytes or lines kills the IDE, but large files seem its Achilles' heel. This surfaced when adding code to the main script of the PyEdit program: a 256,898-byte and 5,141-line prior version worked fine, but a 258,031-byte and 5,160-line new version started failing for no reason whatsoever—until wholly unrelated comment lines were removed (a short launcher script's success was the first clue of size issues). Given today's memory capacities, this size limit is absurd; people do write 5k-line program files, and tools do generate them. It also has no workaround; if your script starts failing inexplicably in Pydroid 3 after adding new features, make sure its code file is under 256K bytes (or 5K lines) in size—or write a two-line launcher that reads and execs the file to subvert Pydroid 3's draconian constraint. Pydroid 3 has a double-back-click option which exits a GUI, and is often required in maximized viewing mode due to the absence of a window-border exit button (the top-right corner's "X" in windows like this). Strangely, double-back exits close GUIs immediately without running their exit handlers. While such silent exits have little consequence to users in Mergeall, they can be catastrophic in other programs that must finalize work on closes, and are at best a use-at-your-own-peril feature. The PyEdit text editor, for example, has an explicit Quit button that works normally, but has no way to offer users a chance to save file changes on double-back exits. Worse, the Frigcal calendar has no explicit quit widget of its own, and hence no way to save calendars in maximized mode. Non-maximized mode does better with a window-border exit button that runs exit handlers properly, but doesn't use available space as well, and can still be the scene of a silent-but-deadly double-back exit. The lesson here: don't use a double-back in Pydroid 3 unless doing nothing is what you mean to do. Though not a factor in Mergeall, pressing the return (a.k.a. enter) key on some Samsung on-screen keyboards does not move the cursor to a new line in text widgets of tkinter GUIs in Pydroid 3. For reasons unknown, the return key's newline character never makes the trip between keyboard and widget, which renders general text-input components virtually unusable. This bug may be limited to specific versions of the Samsung keyboard—it's been observed only when using version 3.2 on Android Oreo, and both older and newer versions' return keys work correctly. But where returns fail, they appear to fail in Pydroid 3 tkinter GUIs exclusively. Luckily, there are at least three ways to work around this glitch if it impacts your device: use a physical Bluetooth keyboard; use Samsung's handwriting input option whose return key works correctly; or simply install an alternative on-screen keyboard whose return key works properly, such as Google's Gboard or Hacker's Keyboard. Both alternative keyboards support multiline-text input in programs like PyEdit and Frigcal, and the latter keyboard also helps with the next glitch on this list. Though this also doesn't impact Mergeall, and isn't a bug in any of the systems involved, PC GUIs designed to expect a keyboard may require redesign or logistical workarounds when used in Pydroid 3, because the on-screen keyboard may not be readily available. The PyPhoto program, for example, requires keypresses to process photos, and its main display has no text input field to tap—the only way to force most preinstalled on-screen keyboards to appear. To work around this, use a Bluetooth keyboard, or install an alternative on-screen keyboard on your phone that can be opened on demand. Hacker's Keyboard, for instance, includes a permanent-notification option which allows you to pop up its on-screen keyboard at any time by clicking the app's entry in Android's notifications pulldown. The resulting keyboard is a complete solution in PyPhoto, and helps with newlines, menu shortcuts, and copy/paste in other programs too (see the notes above and below). Of course, too much of a good thing can also be a bad thing: Android's automatic on-screen keyboard popup may be an unwelcome feature in some Pydroid 3 tkinter GUIs. Interacting with any text field mindlessly triggers the popup—unless it's silenced by marking text fields as uneditable, with Tk's readonly or disabled states. The Frigcal program, for example, required readonly state in Tk entry widgets to mute annoying keyboard popups on most touch gestures that made the program unusable. Mergeall's GUI isn't impacted quite as badly, but its message-text area still required read-only state on Android (which means disabled in Tk's text); otherwise, slower swipes to scroll will trigger an on-screen keyboard popup—which overlays and obscures the very text you're trying to view. A technical keyboard issue not relevant to Mergeall but a potential pitfall to others: Pydroid 3's tkinter also fails to send expected details to general keypress handlers for all physical and on-screen keyboards tested. For instance, the return and backspace keys send tkinter event objects with an empty char attribute and a keysym that identifies the press (as 'Return' and 'BackSpace', respectively). This differs from other platforms but can be worked around with binds to these specific keys (e.g., to <Return>). Worse, though: shifted keys, like + and * on most keyboards, send two useless keypress events—one for the shift key itself, and another for the unshifted key pressed. A Shift+* sequence, for example, sends a shift followed by the unshifted 8 key only; the * never comes through. Binding to specific keys doesn't help in these cases, and mapping unshifted to shifted keys manually seems implausible across all keyboards and usage contexts. Barring a workaround as yet unknown, this makes shifted keys unusable in some tkinter GUIs run on Pydroid 3. This glitch seems unrelated to the newlines issue noted earlier (which fails on just one keyboard), and on the upside appears limited to general keyboard handlers (tkinter text-input widgets process shifts correctly). But it impacts programs like PyCalc that allow numeric operator keys to be entered on keyboards. As is, PyCalc fully supports keyboards in its "cmd" popup input field, (whose use also seems to oddly correct the shifted-keys bug), but keyboard input for its main display is limited to non-shifted keys on Android alone. Android-style copy and paste via longpresses is not available in tkinter GUIs run in Pydroid 3. Instead, to copy and paste text between any text-input widgets: first, highlight text with touch, stylus, or mouse; then either use program-specific widgets (e.g., menu options) where available to copy and paste, or use the PC-like key combinations Ctrl+c to copy and Ctrl+v to paste in keyboards that support these. You'll find support for these keys in both Bluetooth keyboards, as well as alternative on-screen keyboards like Hacker's Keyboard (yes, a pattern is emerging). This works well, but may not be what a typical Android user would expect. The fundamental Button widget in Pydroid 3's tkinter has a pair of issues that seem to reflect state problems and do not respond to tkinter update calls. Only one impacts Mergeall and the other is narrow in scope, but both merit a heads-up for both users and programmers. Most noticeably, on every Android device tested, Buttons lose their bg background-color setting when pressed: their color changes to the recessed default, and stays that way until anything else on the GUI is tapped. This can seem to make a Button appear pressed, but is really just background colors being lost. Curiously, some buttons evade color loss (e.g., those that open common dialogs may be immune, suggesting a timing issue), but most colored buttons are impacted. This colors glitch affects only the "Help" button in Mergeall, but may afflict other GUIs more broadly. The only known workaround requires changing code to either accept the Button's default color, or replace Buttons with Label widgets that use click bindings. Labels retain their background colors when clicked, and their cosmetic and functional difference is trivial (Labels don't give press feedback, but Buttons in Pydroid 3 sometimes don't either). As fix examples, Mergeall eventually chose default colors; the PyCalc calculator program adopted Labels to skirt the issue; and the Frigcal and PyToe programs have used Labels all along. More rarely, Buttons may actually become stuck in a pressed state, in which they remain visibly recessed, and may respond to a future press by triggering two press events at once. Luckily, this glitch appears to be very limited in scope; it has been observed on only one device running Android Nougat (a Samsung S8+) and only occasionally on this device, and has not been seen on any other devices tested—including Samsung devices running Oreo and Pie, and an older Samsung J7 also running Nougat. The flaw trigger on the S8+ is a complete unknown (like much in Android forensics), and there is no known workaround. If your tkinter buttons are truly stuck "on," tap elsewhere in the GUI to "unpress" them. Although not specific to Pydroid 3, the Android issues we've seen besetting Mergeall afflict other tkinter GUIs too. In the Frigcal calendar GUI, for instance, calendar updates are limited to internal storage or app-specific folders on removal drives, and work only on Android Oreo and later due to the same timestamp bug that constrains Mergeall. Violating these rules produces the respective crash scenes here and here. In Frigcal, the timestamp bug kills calendar backups and makes it view-only before Oreo. In other GUIs, Android's bugs and permission rules may limit functionality similarly. Probably the best spin on these is symptoms of still-maturing software. There's more on the other programs noted in this list in the next section. The point here is that while some accommodation is to be expected when translating between PC and smartphone paradigms, issues like those above mean that running tkinter programs in Pydroid 3 is hardly seamless. Even allowing for fixes in its future releases, you'll clearly want to test-drive this app on tkinter programs you'd like to use to see how its support applies. Despite the workarounds and glitches of the preceding section, the second to last of the Pydroid 3 requirements listed earlier is really its most regrettable and grievous downside: the free version of Pydroid 3 will flash distracting and distasteful fullscreen ads in your face every few runs, unless and until you pay a required $9.99 freemium fee. To be blunt, this comes off as ransom, and borders on extortion. It may be a norm in Android's culture, but it is rude and unacceptable in Python's, and makes it difficult to recommend Pydroid 3 to Mergeall users today. Together with the prior section's glitches, this also makes it impossible to integrate the changes required for Pydroid 3 tkinter GUIs into source-code package base files. For example, the coding workarounds that accommodate Pydroid 3's font limitations and webbrowser breakage are specific to Pydroid 3 alone, and the sys.executable fix required for spawns may not work in other apps. Changing portable source-code packages to support just a single app on Android is ethically dubious at best—and just plain wrong when that app employs advertising. Though less convenient, Pydroid 3 today is best supported with the custom source-code files used here. The smaller tkinter tutorial examples in the book Programming Python, 4th Edition work unchanged in Pydroid 3, like this, this, this, this, and this, though some require path settings for imports that can be forced with Python sys.path appends. 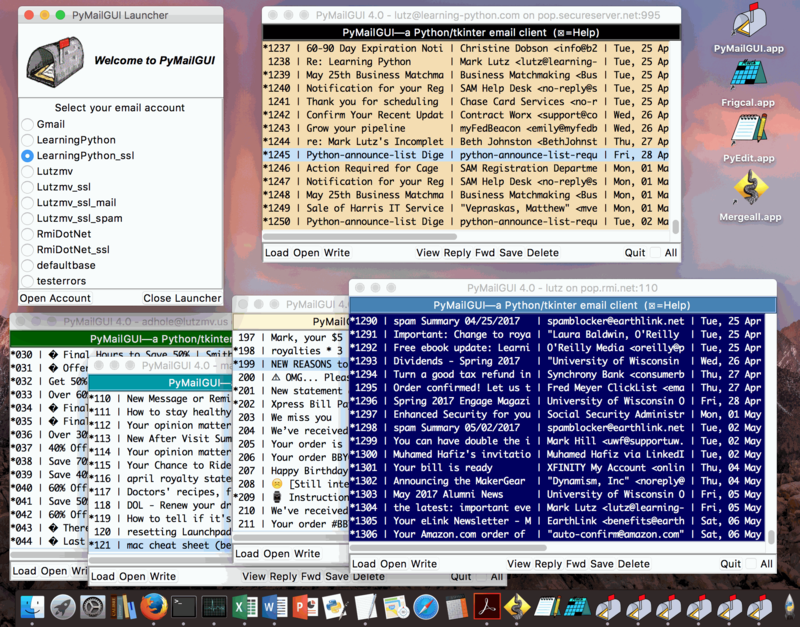 Other major tkinter applications available at Mergeall's hosting site—including Frigcal, PyEdit, and the PyGadgets utilities PyCalc, PyClock, PyPhoto, and PyToe—also run as shown in Pydroid 3 with minimal changes similar to Mergeall's, but benefit more from tkinter support than Mergeall because they lack command-line modes. See this page for a separate how-to on running these programs on Android too, along with a summary of this appendix's Mergeall GUI coverage. Taken as a set, programs like these and others may justify the ransom's price, but this choice is yours to make. Wherever you may land on this issue, there's no denying that Pydroid 3's advertising scheme casts programs like Mergeall in a supporting sales role that's both uncomfortable and unseemly. A free trial period would be much more palatable than obtrusive advertising, and will hopefully be a part of the future of the otherwise-remarkable Pydroid 3 app. Barring that, we'll have to eagerly await the Android debut of free and open-source alternatives for running the free and open-source tkinter. It's a large world after all: Naturally, there may be other tkinter-on-Android options afoot or unknown at this guide's publication, and others may appear in the future. Please exercise the usual due diligence, and check back here for updates as change warrants and time allows. This guide wishes to be inclusive, but some commercial projects may be no more transparent than they are benevolent, and the quality of web-search results has grown inversely proportional to the avarice of companies providing them. In other words, Mergeall's GUI may run on Android, but it's still running on Android. It's easy to verify this: see the permissions test script, and its results on both Pydroid 3 and Termux; the results do not differ between Android Nougat and Oreo and are unchanged by installing Pydroid 3's extra-permissions plugin. The takeaway from these results is that storage access rules are the same for both apps, and updates on removable media are limited in both to the app's own folder. The only real difference in the storage-permissions department is that Pydroid 3 replaces Termux's one-time script run with a one-time automatic request on first access to restricted folders. As we've learned, this means that content on removable media must be nested in Pydroid 3's app-specific folder if it is to be updated by Mergeall in this app. It also means that items to be updated by both Termux and Pydroid 3 must be located in internal storage, because these apps can modify only their own app-specific folders on removable media. Importantly, your choice of Mergeall content folder on SD cards and USB drives wholly determines which access-limited app can change it. For instance, if Mergeall's GUI in Pydroid 3 processes removable-drive content in Termux folders—as in earlier screenshots—it is limited to comparisons only. And while our focus here is on Mergeall, this constraint applies to any GUI run in the app. This is an unavoidable downside to using Android removable storage in these apps. The lesson here is that internal storage—usually at /sdcard—should always be used if possible, because it can be changed by both Termux and Pydroid 3 specifically, and by other apps generally. As an example of the latter set, QPython3, a Python Android app not covered in this guide because it holds no advantages for Mergeall today, has the same storage-access limits per this and this; Android's rules must be hard to beat. So there it is: the good, the bad, and the ugly of using tkinter GUIs like Mergeall's in the Pydroid 3 Android app. To be sure, the tkinter support embedded in this app is nothing short of stunning: it implements nearly all of Tk and tkinter on smartphones, and makes these devices substantially more fun to use, for both programmers and others. You'll have to decide for yourself whether its remaining defects—along with the advertising model of the app that brings it to you—justifies using this support on your phone. Beyond Pydroid 3's tkinter support, there are additional GUI options for Python programs on Android that we don't have space to cover here. For example, while Termux does not offer tkinter support directly, it does provide some X Windows (a.k.a. X11) GUI support that may provide a path to using tkinter in its Linux environment. For a survey, see its links here and here, and the X11 search here. Even if viable, however, X11 support requires substantial extra setup work that may be too much to ask of users running Mergeall alone. Other GUI options offer Android-friendlier alternatives, including Kivy, SL4A, and Qt's PyQt and PySide. Such tools allow programs to use Python for their core logic, but wrap it in GUIs which may better match the Android paradigm. Although their program recoding costs are not trivial, these tools become more attractive for tkinter GUIs that must be redesigned for smaller screens if their audiences are ever to include more than the most-stubborn tkinter fans. At the end of the day, Pydroid 3's tkinter support is admirable and even amazing, but the approach it offers for Mergeall really just swaps command lines for a GUI run in an IDE that requires extra code changes and comes with noticeable seams. Whether you find it easier to sync your content by running a single command in Termux, or opening and running a source-code file in the Pydroid 3 IDE may very well depend on your background. For this guide's money, though, the latter is just enough extra steps to qualify as runner-up. And now for the closing cliff-hanger. True to its thrashing-laden history, Android seems poised to radically alter storage-access permissions again and soon, with potentially profound impacts on both Mergeall and the Android platform in general. Although this change is still tentative, this appendix provides a preview of its implications for users of Android and Mergeall in one possible future. This how-to has gone to great lengths to document the permission rules for internal and removable storage that existed at the time of publication, especially in sections here, here, and here. As covered, these rules apply to apps running on Androids KitKat through Pie, of which only Oreo and Pie are actually useable for Mergeall due to an earlier Android bug. Some of this may be mitigated by wildly proprietary and convoluted interfaces, but they are unlikely to see widespread use, especially in programs that run on multiple platforms. Either way, this change would impact nearly every program that updates shared content on Android devices (including Mergeall), and might be an endgame for this platform's broader potential. For more on this proposed change, read the terse announcement here, and watch outraged Android developers pleading and petitioning for a reversal here, here, and here. Caution: the language at some of those links is understandably explicit. If this change becomes permanent—and KitKat's example suggests it may—it threatens to make a host of existing programs based on the portable POSIX standard unusable on Android; render Android's internal storage just as locked down and limited as that in iOS; grossly restrict what users can do with their content on their phones; and effectively kill the platform as an option for general-purpose computing. Simply put, under the Q model, Android devices will be reduced to launchers of fenced-in apps, and lose all rights to the title of "PC alternative." Indeed, the better analogy for the proposed Android seems the cartridge-based Game Boy of eras past. Unfortunately, content thus stored could generally be updated only by the sole app whose folder hosts its storage, and would be automatically deleted if that app is ever uninstalled. While these major constraints already apply to removable media today, extending them to internal storage may make the Mergeall program impractical for many or most users on Android. If viable, this might avoid the delete-on-uninstall peril of sandboxed folders, and may support access from multiple apps. Also unfortunately, the beta release's documentation of proposed rules for the Download folder suggests that files stored there may be app specific too, though this is described thinly and ambiguously, and will have to await empirical analysis on widely used devices. In fact, the very definition of "access" to be restricted is unclear in the beta documents; apps may still be able to read anywhere in internal storage (as for removable media today), but shared-storage writes—essential for content creation of any significance—are almost certain to vanish. As a last resort, the beta release also references Android's Storage Access Framework, but this seems irrelevant in Mergeall's use case, and a nonstarter for cross-platform Python code run by an app which sets permissions policies. In the end, Mergeall and similarly general tools may run on Android Q, but they're likely to be much more difficult and dubious to use. Content collections that are accessible to just one app and may be subject to accidental removal would probably not be worth storing on your phone. Naturally, it's impossible to predict if these restrictions will turn out to be anything more than beta-release drama. There is substantial developer pushback at present; apps like Termux and Pydroid 3 that run Python code may implement broader storage permissions and interfaces in response; internal storage might take different forms on different phones that cannot be foreseen; and Android Q's compatibility mode might save the day by retaining the current internal-storage permissions of apps used in this guide—at least unless and until those apps target later releases, you uninstall the apps, or you upgrade to a newer phone. For this story's thrilling conclusion, watch this guide, check the web, or test on later Androids yourself. What is certain is that deliberately hobbling the Android platform is sure to limit both its users' options, and its devices' scope. Expanding proprietary restrictions to internal storage would make portable tools like Mergeall nearly unusable on Android, and constrain the platform to artificially narrow—and even toyish—apps. Such apps might appeal to technically naive masses and generate proportional advertising revenue in the process, but the restrictive platform hosting these apps will hold little interest for the skilled development community that produces nontrivial programs used elsewhere. The net effect would deprive smartphone users of much useful software, and knowingly retard their devices' utility. This would be especially ironic at a time when foldable displays and ample storage hold the promise of expanded roles. Though more subtle and speculative, this change may also help drive smartphone users to cloud-based storage in the face of unworkable alternatives, boosting subscriptions, trackable content, and single-source control as darker by-products. In short, Android would remain a carefully crafted arena of exploitation, justified by red-herring security arguments and fueled by greed. Let's hope that's not what Android's owner has in mind.